How many plants do I need to save vegetable seeds? How many miniature sheep per acre? I'm bound and determined to grow our onions from seed rather than sets because it costs much less and the onions will store through the winter rather than giving up the ghost in late fall. One year, I had a beautiful harvest from seed, but the next two years I got just a few small onions. So this spring, I decided to try out several different methods to figure out the simplest way to grow onions effectively from seed. It looks like the pros who tell you to start your onions inside and then transplant them are right since treatments 3 and 4 are the clear winners. (It doesn't seem to matter whether you transplant into a quick hoop or not.) However, I was interested to see that if you're lazy and don't like starting seeds inside, you can get results nearly as good by direct-seeding into biochar-doctored soil under a quick hoop at the same time you would have started your onions inside. 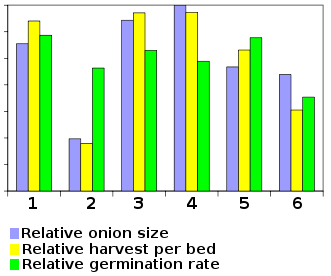 My sample size for that treatment was extremely small (half of a bed), so I'd hate to have anyone plan their entire year's onion harvest around that observation, but it's definitely worth further experimentation. 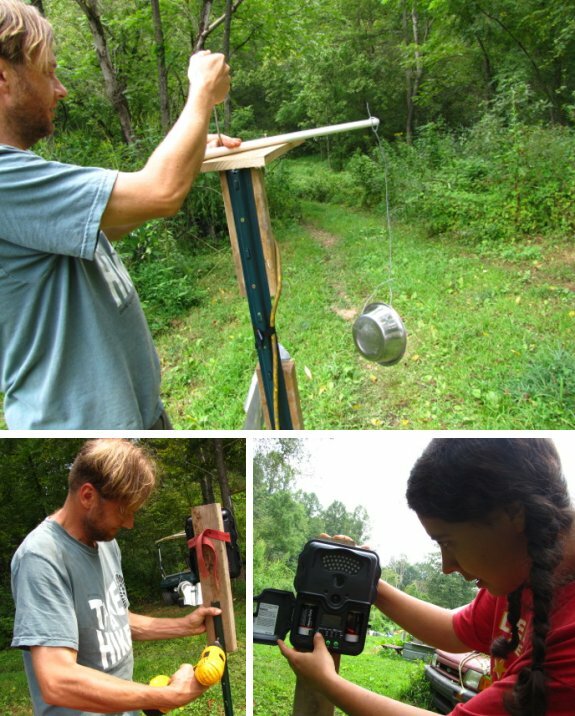 Our chicken waterer is the result of Mark's experiments at bringing clean water to our backyard flock. We've been having some trouble with our creek pump and the first place we decided to upgrade was the quality of the wiring. You can get a 250 foot roll of outdoor grade 12 gauge 2 wire for around 138 dollars. Our stretch is just over 300 feet, which required the above 4 dollar junction box. The plan will be to silicone up the ends and mount it on a tree above the point where the flood waters usually get. Anna How many plants do I need to save vegetable seeds? As I slowly work my way beyond the seed-saving basics, I'm starting to realize that saving the seeds from the lone kale plant that overwintered in my garden might not be a good idea. To understand how many individuals you need to save healthy seeds, first you have to delve into a bit of pollination biology. At the opposite end of the spectrum, strong outbreeders (like most crucifers, swiss chard, spinach, and beets) depend on getting pollen from another plant to keep those recessive genes in check. You'll need around 80 to 100 individuals of these species in your garden to keep your seed vigorous. If you save seeds from just a few individuals, next year's plants will tend to be weaker and you'll eventually need to buy seeds to reset your gene pool. Most plants, of course, lie somewhere in the middle, and there are also outbreeders (like most cucurbits) that don't seem to show many problems even if you inbreed them. You can download a free pdf here that gives recommended population sizes for most common vegetables. (The website asks for your email address before download, but they haven't sent me any spam. The file you want is A Seed Saving Guide for Gardeners and Farmers.) Alternatively, if you want to become a real seed-saving pro, I can't recommend Seed to Seed by Suzanne Ashworth highly enough. This text made the very short list of book purchases in our household for 2012 and has turned my dabbling in seed-saving into a scientific endeavor. Our chicken waterer keeps your flock happy and healthy. It has been a very wet year. 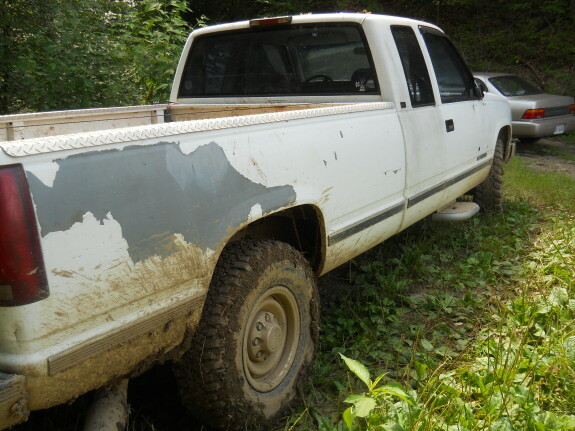 The truck has been stuck most of the summer. Today we got close to getting it on its way....but it's still stuck. Maybe tomorrow will be dry enough? Although breadseed poppies and opium poppies are in the same species and look very similar, it's legal to grow your own poppy seeds. Many websites will tell you otherwise, though, so I was afraid to try my hand until I found culinary poppy seeds being sold by a reputable seed company. Growing poppies is pretty simple, but I've learned a few tricks over the last couple of years to increase yields. Unlike most ornamental poppies, breadseed poppies aren't hardy enough to be seeded in the fall here in zone 6, so you should instead scatter the tiny seeds lightly on the soil surface in late February. If you live in a warmer climate, you might get away with seeding in late autumn. In 2010, I sowed my seeds too far apart, so this year I planted more heavily with the result that the seedlings formed a solid mass of green across the bed by late April. That seems to have been overkill --- fewer poppy seeds came up on a different bed, and these better spaced seedlings resulted in much larger pods. I suspect that the optimal distance between plants would be about four inches in a highly productive, no-till garden, although extension service websites suggest 6 to 8 inch spacing in a more conventional garden. If you're going to overplant and thin, remove the extra seedlings by March or early April --- I thinned later than I should have in the photo above. 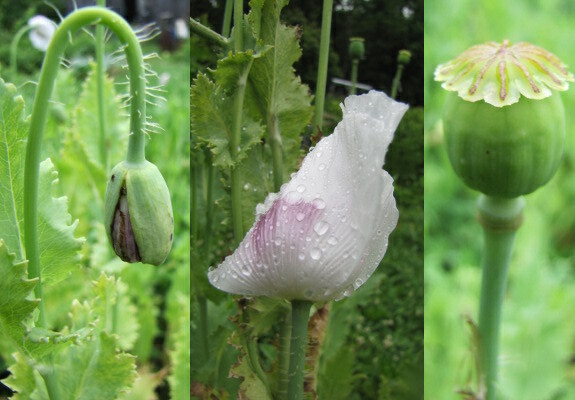 Your breadseed poppies will be in full bloom in June, and your honeybees will love them. Besides keeping the plants weeded, you don't have to do anything now until the pods bulk up and then turn brown. At that point, snip off the seed heads and bring them inside to dry. 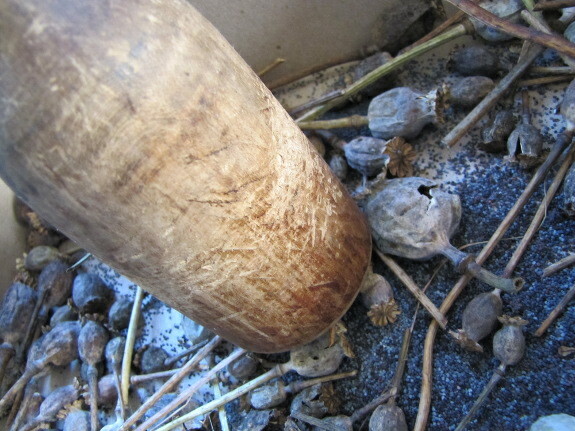 Once the poppy heads are entirely dry, tiny holes near the top of the pod will open, so it's technically feasible to shake mature pods in a paper bag until all of the seeds fall out. In practice, though, it's much more efficient to pound the pods to crush them, tear the heads open a little more with your fingers, and then shake out the seeds from one pod at a time. This really doesn't take very long if you've just grown a small patch of poppies. 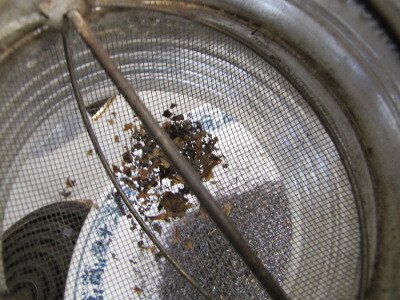 Poppy seeds are too small to winnow easily in front of a fan, but you can remove nearly all of the bits of chaff by sending the seeds through a sifter. Let the seeds dry a bit more in an open container, then seal them away for winter treats. I've discovered that if I paint raw egg on the top of homemade buns before their last rise, sprinkle on breadseed poppies, then mash the seeds into the dough with the palm of my hand, nearly all of the precious seeds stay in place and the plain old bread turns into a treat. I figure this year's quarter cup harvest will last all winter. 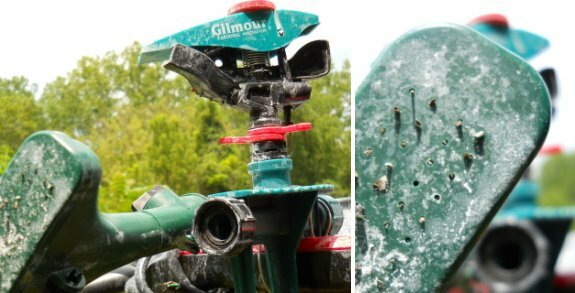 Our chicken waterer never spills on uneven terrain, so it's perfect for chicken tractors. We figured out the problem was not with the wiring. I'm still glad we upgraded to the 12 gauge wire, which might help our new pump last longer. The PVC pipe I cut in half to hold the pump turned out to be a mistake. It was allowing clay to accumulate next to the motor, which might have been causing it to overheat and then to shut down. We deleted that "improvement" today. Another mistake might have been upgrading the power from 1/2 horsepower to 3/4. 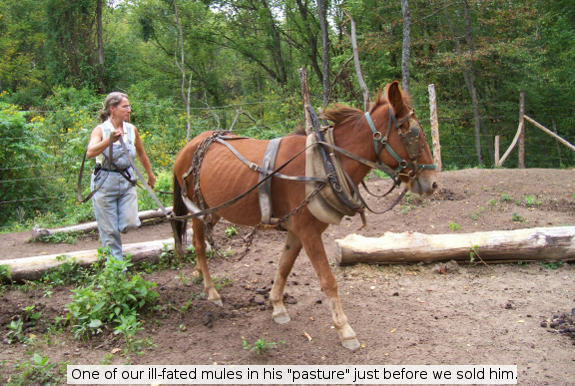 We decided to take back the 3/4 horsepower pump to Lowes and order a 1/2 horsepower pump from our local hardware store. The new pump is made by Myers, and the step down in power cost more than the Lowes 3/4 pump by about 50 dollars, which I feel fine about. I'm confident our local guy is not gouging us on the price and think that this may be a higher quality device. It sure is nice to not have a garden full of thirsty vegetables. 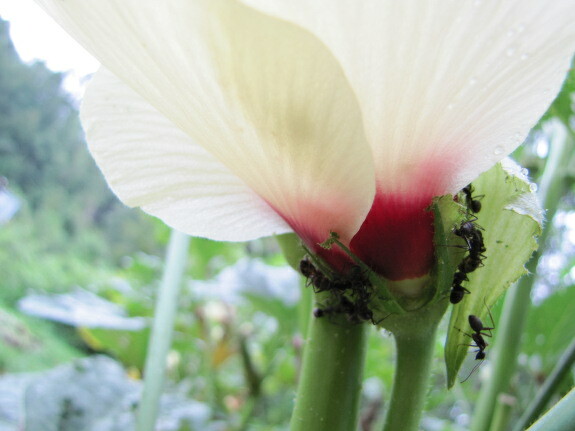 The bases of our okra flowers are currently loaded down with big, black ants. What the insects are doing is beyond me. My first thought was that okra must be one of the plants with extrafloral nectaries, but a google search turns up no useful hits on the combo of terms. Instead, I learned that fire ants will often feed on the base of okra bloom buds and cause the flowers to abort. Luckily, these are neither fire ants nor bloom buds, and my fruits seem to be setting fine. 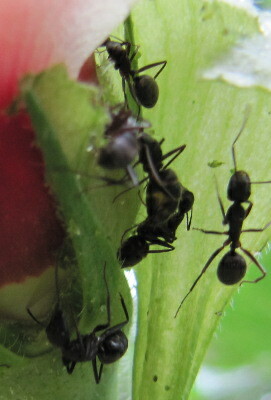 A close look shows that the ants aren't farming aphids --- the other way ants could harm okra. So what are they doing? We bought a heavy duty cutting blade for the new Stihl FS-90R weedeater a few weeks ago, but didn't read the small print and missed out on the collar nut-thrust washer kit, which is mandatory if you want the blade to stay bolted to the machine. A 2 minute search on Ebay turned up a nice guy who sells the kit for a bit over 10 dollars. I'm very pleased with the performance and cutting power. 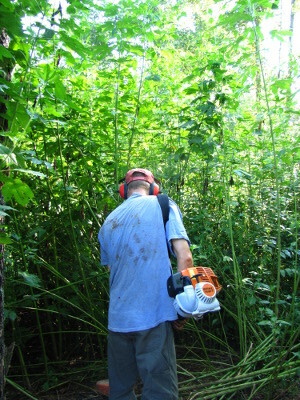 We let some of the forest garden weeds get so high that most of them were over my head. It only took a matter of minutes to cut them down to ankle height. Maybe next year we can cut them before they get high enough to swallow 5 gallon buckets, which are no match for what I've started calling the "Ninja Blade". It's tough to think long term when you're struggling to keep your short term affairs in order. That could mean not putting money in your retirement account because you can barely pay the bills. Or, in the Walden Effect world, it could mean neglecting your perennials because the annual garden is all you can handle. 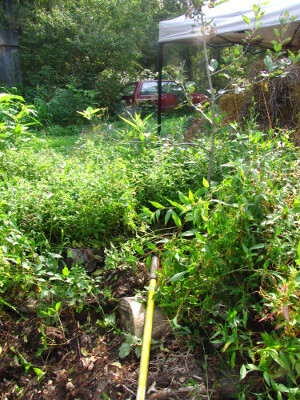 The photo at the top of this post shows our poor forest garden, untouched since I halfway mulched a few areas in the winter. Somewhere deep in that tangle, two baby apple trees, a baby peach, a medium-sized nectarine, a plum, and a young hazel bush are hiding, along with four tomato plants, some perennial herbs, and a whole bunch of butternuts and naked-seed pumpkins. Okay, the last two aren't really hiding --- as annuals, I gave them attention, so they are happily mulched, although starting to run into the weeds. 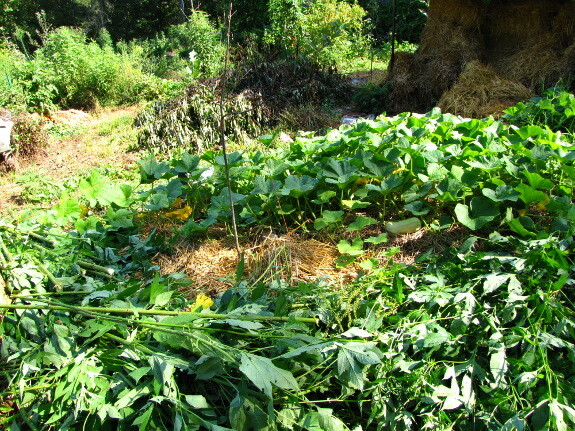 Four and a half man hours later, the worst half of the forest garden has been reclaimed. Now our seedling fruit trees won't have to compete with ragweed taller than they are, with dodder sucking out their juices, and with a general lack of love. Plus, I can delete the constant low-level stress of worrying about the forest garden's inhabitants. 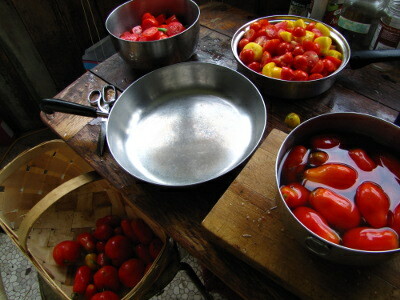 In retrospect, the one thing I did right in the forest garden this year was planting four tomatoes amid the trees. We love tomatoes so much that I wasn't willing to risk any of the harvest, which is what finally pushed me over the edge to putting forest garden renovation on the list. Maybe that's a bit like setting up automatic, monthly direct deposits into your retirement account? 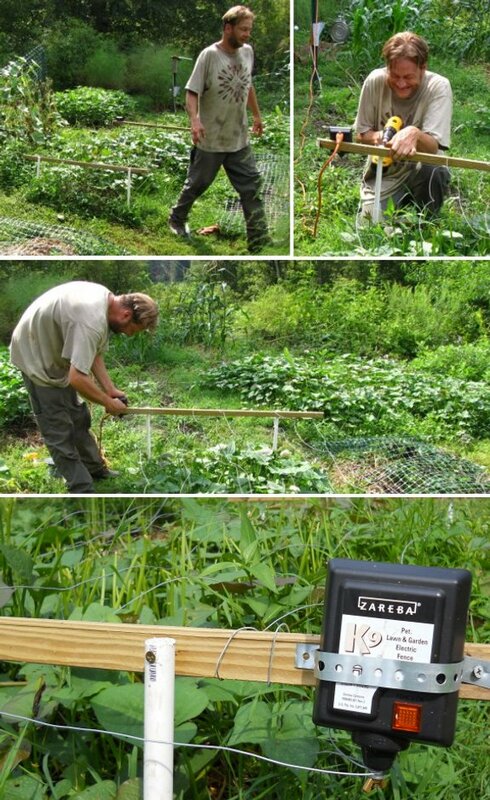 Our chicken waterer cuts chicken chores in half so you have time for your garden. A big thanks goes out to Roland's scientific comment on my Tuesday post concerning our muddy driveway and truck traction. 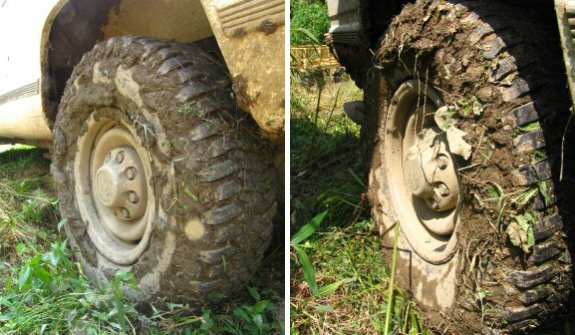 It helped in convincing Anna that upgrading the back tires might increase traction without doing further damage to the flood plain. We got the truck free just before sunset yesterday, and woke up early to visit our local tire store and manure pile. The next size up in tire and traction cost us about 180 dollars. What also helped was moving the old back tires to the front. This will help control the steering more, which I think was a factor in driving out of the rut the last time it got stuck. I thought I was so clever scooping seeds out of my monster squash to save for next year's garden. But once I rinsed the seeds off and let them dry, it became evident that the flat, shriveled seeds weren't going to be viable. What did I do wrong? Further research turned up the information that I was skipping a step in my seed-saving endeavor. First, I should have waited until the monster squash was mature enough that I couldn't dent the skin with my fingernail (which I discovered on my second try resulted in a more orange-colored and warty fruit.) 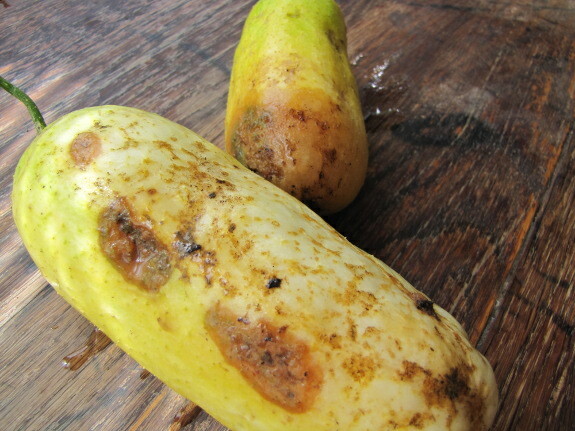 Next, remove the mature squash from the vine and let it sit for two weeks before crushing the fruit under your heel and scooping out the innards. If you've done everything right, the center of your summer squash should actually look like the inside of a pumpkin or other winter squash. The seeds will be mixed in with strands of moist flesh, and there will be a significant amount of air space. As you pull out the seeds, the squash guts will smell just like the hollowed out center of your jack-o-lantern. 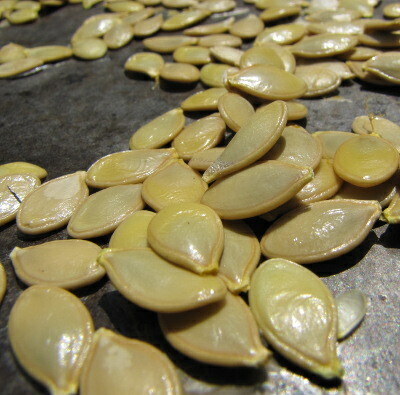 After rinsing my second round of squash seeds and pouring off any that floated in water, I ended up with the plump seeds shown here. Success at last! The above picture of our truck being parked in its designated spot represents a small victory for us. It's a hard thing to gauge, but if I had to guess I would say the new tires are giving us a 30 percent increase in traction and steering control. 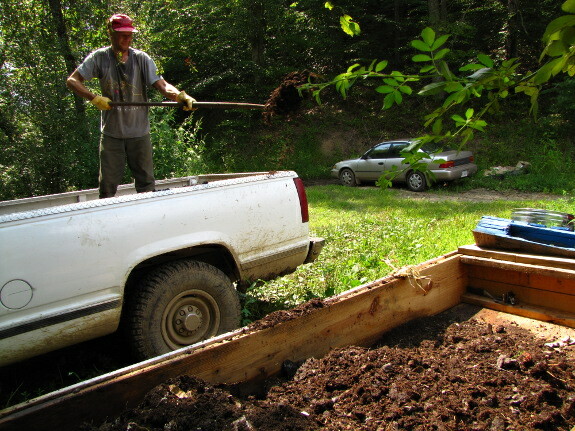 We've been able to haul in some much needed manure, a load of firewood, and a new futon couch during what must be our driest stretch of 2011 so far this year. The next step will be to pick up a load of big gravel to fill in some of the troubled spots...that is if the rain can hold off for another few days. 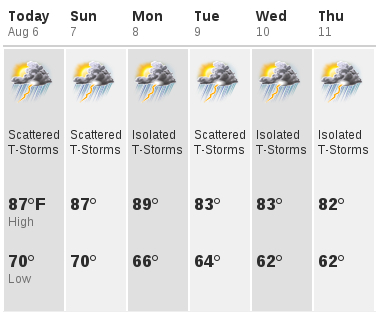 The ten day weather forecast is often what spurs us on to crazy exploits. 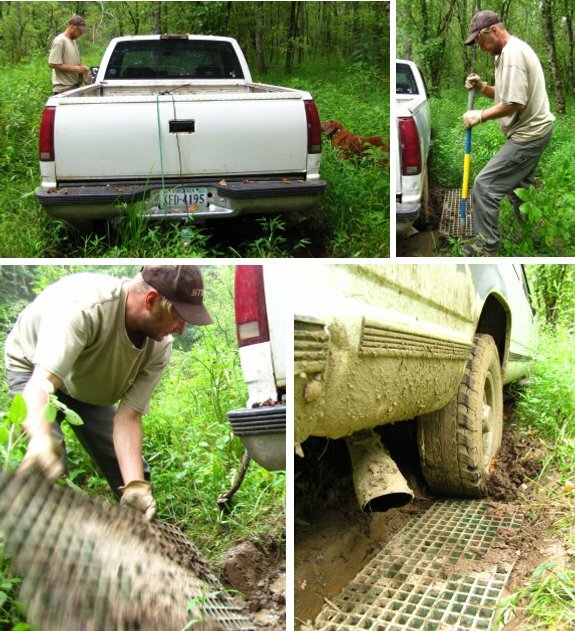 Realizing that Friday was our lone day of sun before the rain set back in, Mark donned his work clothes at 8:30 Thursday evening and rocked the truck out of what remained of the mud. Twelve hours later, he was in town replacing the tires and then shoveling masses of horse manure into the truck's bed. Meanwhile, I stayed home to see what I could do about scavenging some bricks from the old house's chimney and collecting bits of discarded rip-rap to toss in the most muddy part of the driveway. 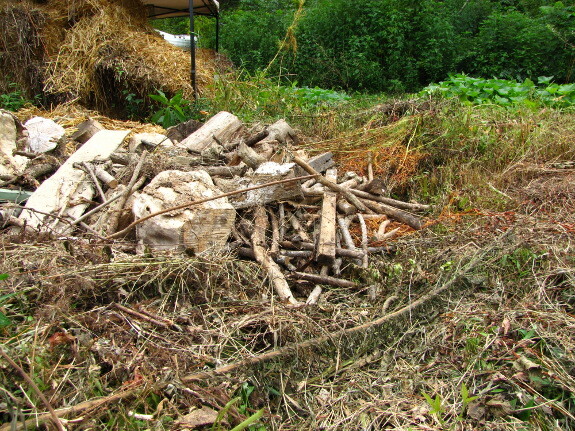 Then I rearranged the woodpile to put all of last year's wood in the front and cleared a path so the truck could be driven around to the back. Finally, I cooled down from what was already turning out to be a scorcher. 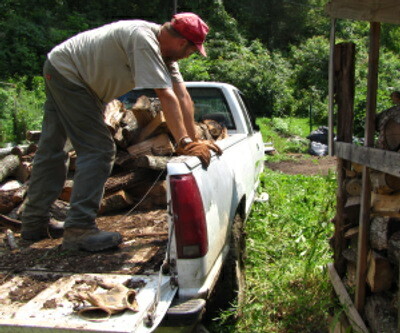 You see, I had a crazy, over-ambitious plan of not only unloading the horse manure, but also hauling in the load of firewood we'd had delivered to the other side of the creek, and I figured that if Mark and I tag-teamed our mandatory cool-down periods, we could get twice as much work done. So, in a rare show of housewifery, I met him at the door with his AC running on high and a cup of ice water and cold watermelon in my hand. He ate that (and his lunch) while I unloaded the manure --- so much easier to shovel it out of a truck than in. 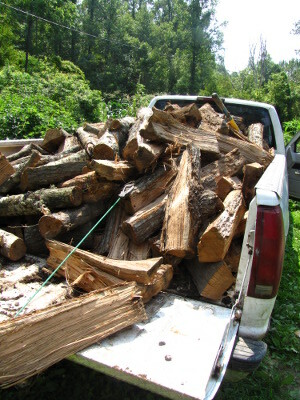 The day had taken on a dream-like quality by the time the two of us heaved huge slabs of wood into a towering pile in the truck. 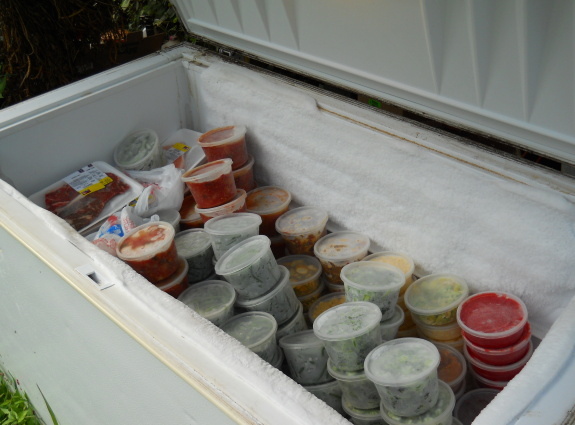 We filled the cab with chicken waterer supplies that had also been piling up in the parking area and I walked home while Mark and the truck did the work of about 100 people by transporting goods the third of a mile to our trailer. I made Mark go cool down again while I unloaded the light boxes. This was clearly a mistake --- I seem to know Mark's limitations better than my own, and the afternoon sun was pounding on my hatted head despite the lightness of my burden. By that evening, I would be suffering from the early stages of heat exhaustion --- a pounding headache, clammy skin, and nausea. But at the time I was running on adrenaline --- look at all this biomass driven right to our doorstep! Luckily, Mark thought the suggestion that I unload the firewood by myself was nuts, so he handed me wood off the truck while I obsessively stacked it into neat rows, segregated from last year's bone dry wood which we'll use first. I'm always amazed by the power of teamwork, which in this case meant that we unloaded the truck in perhaps thirty minutes flat. "So, I was thinking," I tentatively broached the subject of yet more hauling. "I know you've been eying that futon..." Mark's room was devoid of furniture save a bed, and he'd been wanting a futon for months. There was no point in buying any furniture, though, when we had no way of bringing it home. Maybe this was our chance, if we could survive a few more hours driving to town? Mark was game. And that's how we ended our Friday at 8:30 pm, a truckload of manure, a truckload of wood, and a futon (and wheelbarrrow) richer. I went to bed shortly thereafter with ice on my head, but it was all worth it. Mental note --- when I complain about us starting work late on dark winter mornings, I need to remember the twelve hour summer days that preceded them. Anna noticed some additional deer damage near the sweet potato leaves this morning. I noticed a mother deer with two small ones yesterday near a neighbor's mail box when I was driving back from the post office. They seemed more bold than most deer and took a few seconds to scurry off into the woods where as most deer around here bolt at the slightest hint of a car. I'm thinking it's the same trio that's been attacking our garden since the 22 hour power outage we had last month. 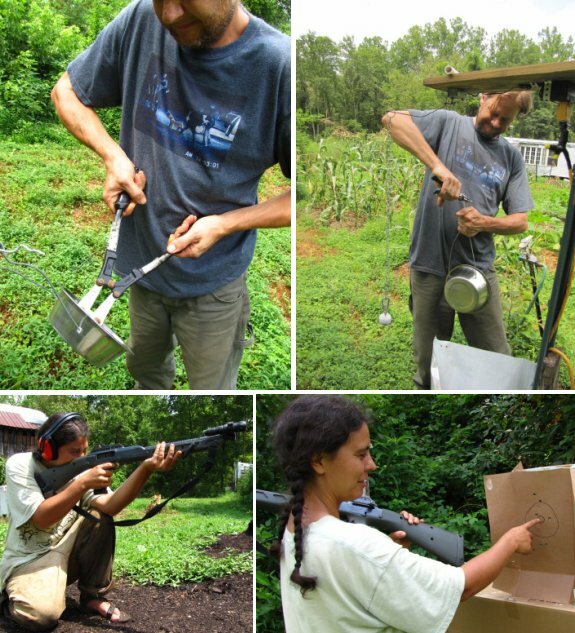 We changed one of the mechanical deer deterrent clangers from a pet bowl to an old baking pan and Anna brushed up on her shooting skills. If things get much worse we'll start taking turns waking up early in hopes of ambushing the offending deer while at the same time adding some venison to our winter meal plans. 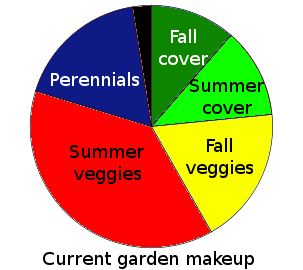 By now, parts of your summer garden are probably toast. That early sweet corn should be long gone, maybe you pulled out some buggy beans, and you're about to dig your potatoes. Or perhaps you have trouble zones where the soil wasn't good enough to support much of a crop and you're thinking about writing that bed off entirely. Once you set aside some good ground for your fall garden, now's the perfect time to plant the rest in winter cover crops --- they'll create organic matter, prevent erosion, cut down on winter weed growth, and add beauty to the winter garden. The perfect winter cover crop for a no-till garden can handle problematic soil conditions, will thrive in the fall and early winter, then naturally dies back when the coldest part of winter hits. Here in zone 6, I've found only two winners that really fit the bill --- oats and oilseed radishes. 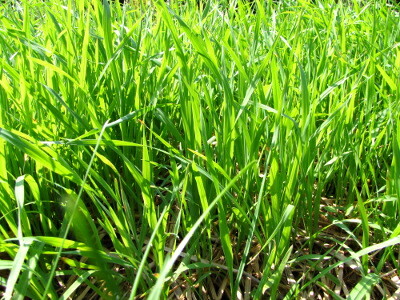 Oats have the advantage that they are available at my local feed store (which means the seeds are dirt cheap) and the plants leave behind a light mulch that will protect the soil until it's time to plant summer vegetables. 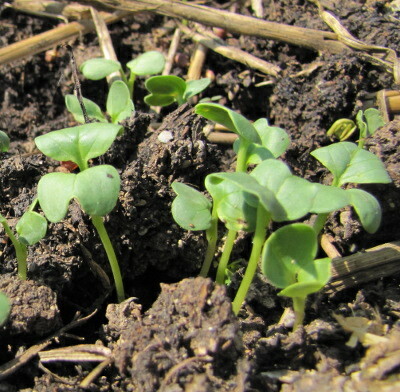 Oilseed radishes hold their own, though, by aerating and adding organic matter deep in poor soil, then rotting fast enough that I can plant spring vegetables directly behind them. After a year of experimentation, I've decided that oilseed radishes will go into the very poorest soil of my garden while oats will be planted almost everywhere else. 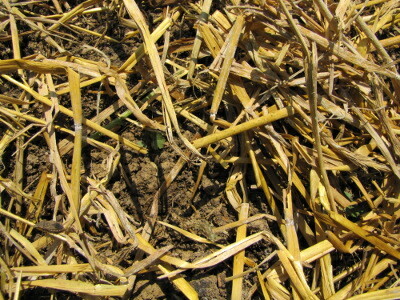 Unless you have fancy equipment to do the work for you, cover crops aren't worth the extra effort of seeding in rows. Instead, I've had good luck broadcasting oat seeds on the soil surface and covering them with a very light mulch of straw to keep the ground moist while preventing seed predation by our intelligent sparrows and cardinals. Radish seeds are less tasty, so I often toss them directly onto the soil surface with no further care. 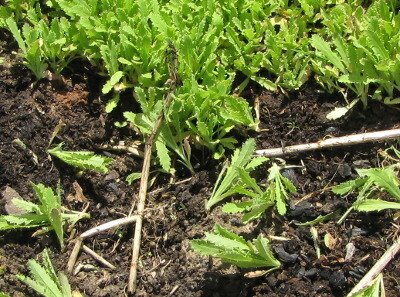 (Do be aware that in really hot, dry weather, the radish seedlings can burn to a crisp if planted this way.) A safer (but more time-consuming method) for planting both is to rake back the top half inch of soil, broadcast your seeds, and pull the soil back overtop. There are several winter cover crops that can be planted later than September 15, but I've found that barley, crimson clover, and (especially) annual ryegrass are tough to kill without tilling. I suspect that any cover crop that can be planted within a month of the first frost date will be too cold hardy to die on its own over the winter. For beginners who live in zone 6 or colder, I'd recommend sticking to oats and oilseed radishes this year for a beautiful and bountiful winter cover crop. Our chicken waterer cuts time to care for your backyard flock in half. 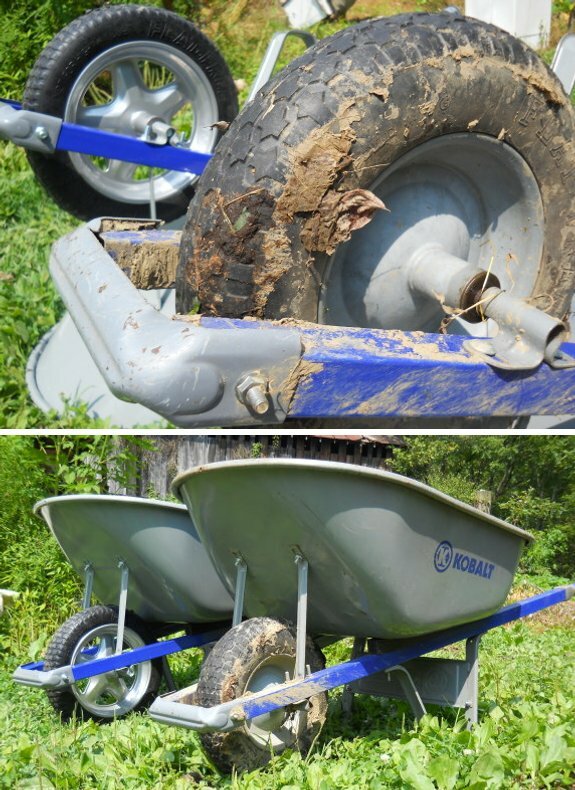 We've been liking our Kobalt Neverflat wheelbarrow so much that we decided to get it a companion. The guy at the store said it was a long shot, but if they spark within the first 90 days then you've got at least a 20 percent chance at producing some viable hybrids. This particular species has been known to have litters as high as 10 little ones, but 5 is more common. Of course we won't need that many wheelbarrows if the coupling does happen, but I have a feeling it won't be too difficult to find good homes for a handful of young Kobalts ready to haul their way into a lucky gardener's heart. The forest garden area we renovated on Thursday has been a major experimenting ground for me because I'm trying to find a way to grow useful plants on highly degraded soil. Previous owners had used this spot as a pasture, and I suspect they overgrazed it so much that every bit of topsoil eroded away. 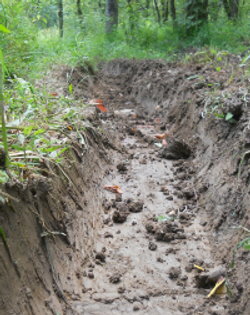 As a result, there's a gully leading from the forest garden down to the floodplain, absolutely no topsoil above the bare clay remaining in place, and a very high water table. On the positive side, the spot gets good sun and is close to our trailer, so it's easy to keep the deer out. Clearly, the ground is worth renovating back into production. I'm slowly figuring out ways to grow things in this extremely sub-prime soil. The trick is to raise the plants' roots up high enough that they don't drown while also adding enough organic matter and mulch that the plants have something to eat and don't dry to a crisp in the summer sun. Planting trees in raised beds works well for year one, but by year two the trees want to spread their roots further, so I need to keep expanding the mound --- this winter's hugelkultur donuts seem to have been a good option in that regard. When Mark cut all of the weeds I'd let grow up over our heads, I raked some into piles alongside the tree beds for a new experiment. My hope is that they'll rot down slowly enough that the greenery will act like a kill mulch and smother weeds underneath. 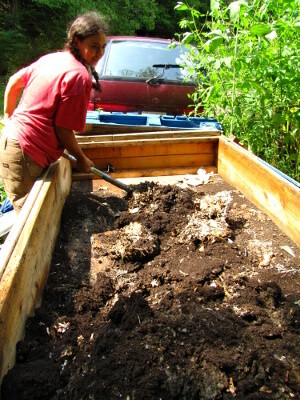 Meanwhile, the composting weeds will add organic matter and height to the soil. I even threw some firewood that was too punky to split into the lowest spot for yet more height and organic matter. 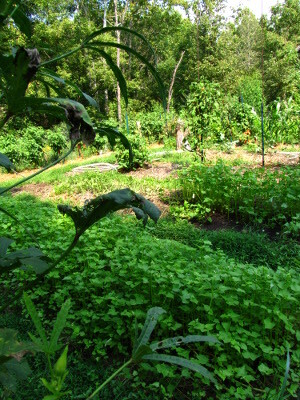 The beauty of permaculture is that every problem can be viewed as a benefit. Yes, this part of the garden is extremely troubled, but the high groundwater acts to subirrigate my beds, keeping roots moist and the leaves dry. 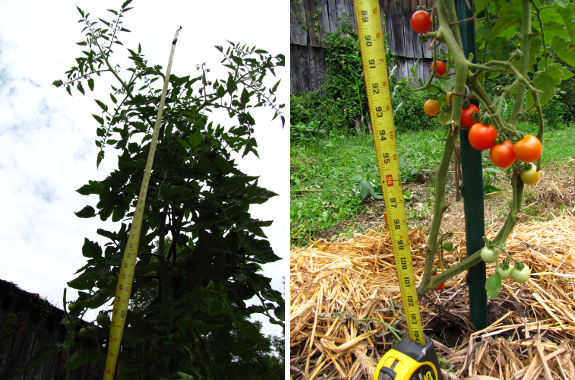 The tomatoes in the forest garden are taller than the unwatered tomatoes in tomato alley and less blighted than the tomatoes in the watered part of the mule garden. Maybe I should plant all of my tomatoes here next year? Our chicken waterer eliminates poopy water and nasty farm chores. 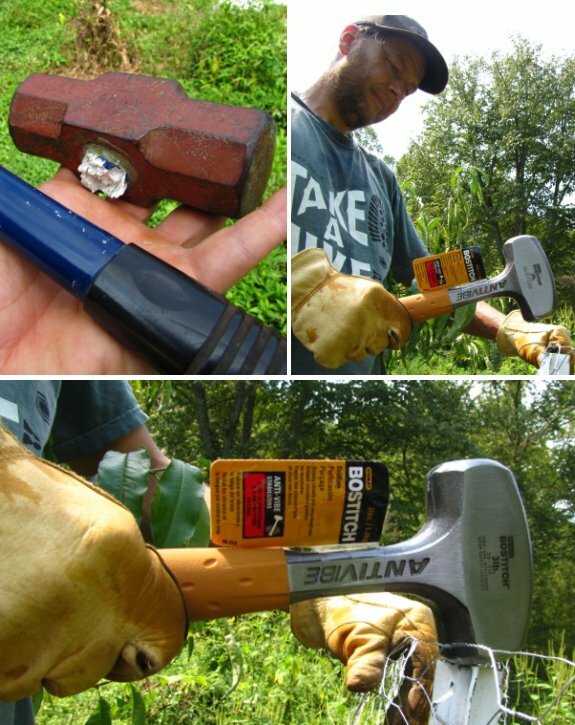 How to build a StinkMaster smelly sprinkler deer deterrent. 1. 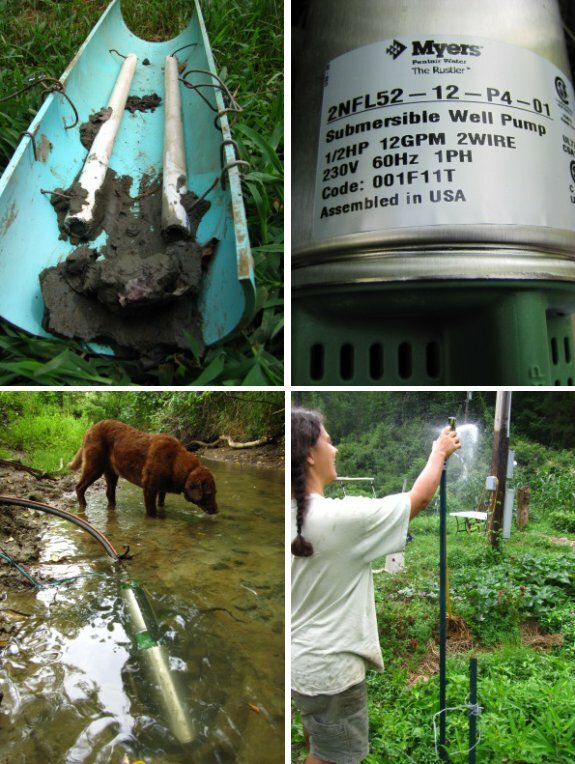 Place submersible pump at the bottom of a large trash can. 2. 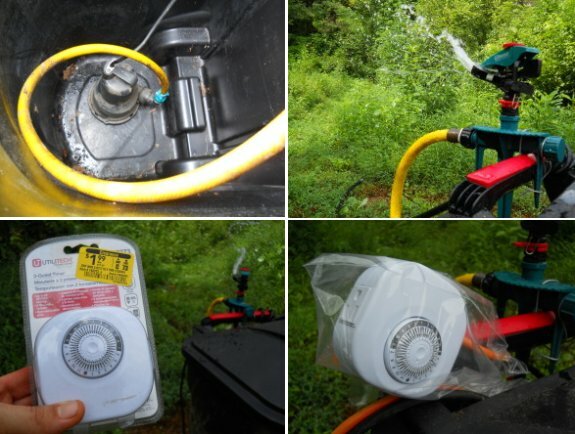 Hook modified garden hose from pump to sprinkler. 3. Fill trash can with water and scented soap. 4. 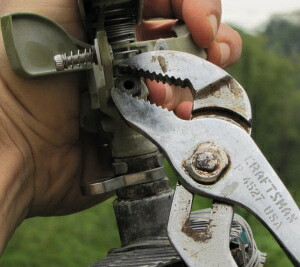 Adjust timer so that pump turns on for a short burst and off for maybe an hour. The goal is to spook the offending deer with a fresh, unnatural scent. So you took my advice and planted buckwheat and/or cowpeas as a quick summer cover crop, but you've actually got a longer fallow window than the cover crops need. Once you start to see tiny fruits forming on the cover crops (like the green triangles in the photo above), it's time to get them out of there so that they don't set seeds and become a weed problem. Why not toss another round of summer cover crop seeds on the ground before cutting, then let the first cover crop act as a light mulch to promote germination of the later planting? 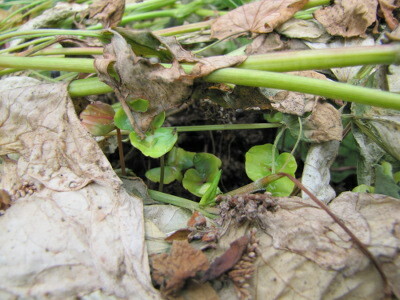 I tried out this method a week ago, and little buckwheat seedlings are already poking up through the debris. I'll let you know how solid of a stand I end up with, but if this planting method works, it's definitely the easiest way of getting summer cover crops established. The deer came back last night and ate more sweet potato leaves. We've now got a 110 volt surprise waiting for them when they return. As much as I swear by Mark's deer deterrents, I'm coming to realize that they're a bandaid. The ultimate solution to keeping deer out of our garden is going to require no electricity, because power outages have become our Achilles heel. On the larger scale, I think the solution is hunting. Unfortunately, the game laws (and local hunter ethic) in our area are stacked in the favor of increasing the deer population, so we're unlikely to be able to solve our own problem by shooting a few deer. Instead, I think we need to prevent the deer damage at a medium scale by considering where the deer enter our garden. When we first moved in, the deer came from all directions, but I've noticed that the mule and back gardens have shown absolutely no signs of deer damage for the last year and a half. Instead, the deer are only entering at the three locations marked by arrows on the map above. So what are we doing right in some places, and can we replicate it to save the beleaguered front garden? The reason the back and mule gardens are untouched is because they are moated in. On the north side, chicken pastures and the barn form a barrier that's too uninteresting to deer to make it worth their while to cross. I'm quite aware deer can easily leap a five foot fence if they want to, but since nothing in the chicken pasture looks interesting and since we're down there so often, they take the path of least resistance and stay away. I've read permaculture books that call this strategy building a "chicken moat." The west side of the back and front gardens is protected by an extremely steep slope. Lucy has a path she sometimes takes down this escarpment when she's in a big hurry, but so far, the steepness has made a good barrier to deer. Again, path of least resistance. 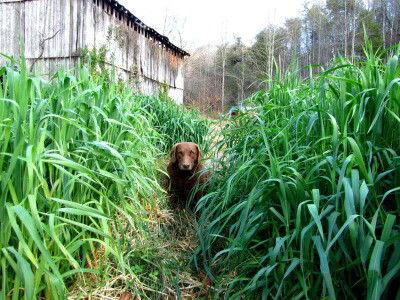 On the east side of our growing zones, the barn and another chicken pasture protect the majority of the boundary. Three years ago, deer sometimes walked up the driveway and into our domain, but I think some combination of uninteresting food plants within the first few hundred feet combined with our frequent activity in that zone keeps the deer away. So our only real problem now is to the south. If we could prevent the deer from walking into that part of the garden, we would be protecting our entire perimeter without electricity. But how? 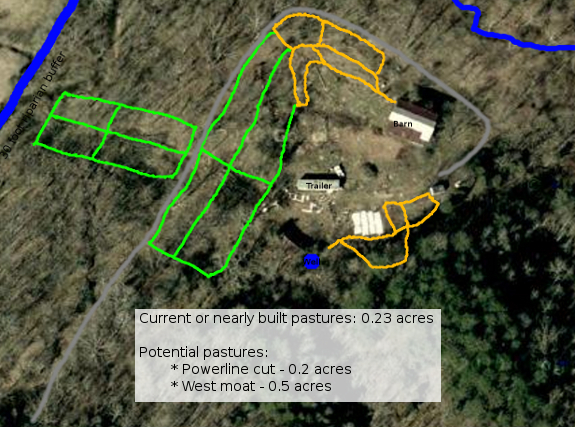 Adding another chicken pasture to moat off the southeast corner is already on the drawing board, but I'm unwilling to pasture chickens within the watershed of the well. 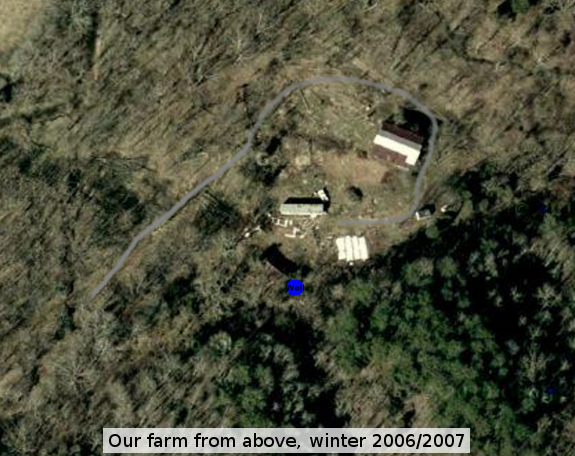 As you can see in the aerial photo below, there's a little hill between the south pastures and the well, which protects the quality of our drinking water, but I'm leery of grazing chickens any closer. The jungle of weeds that has grown up around the mostly-torn-down old house definitely makes the deer feel safer when they come in from the south, so house removal is on the to do list as well. But I think that even if the south border was mown to remove all deer shelter, the garden would still look enticing, especially since we don't walk up there very often. 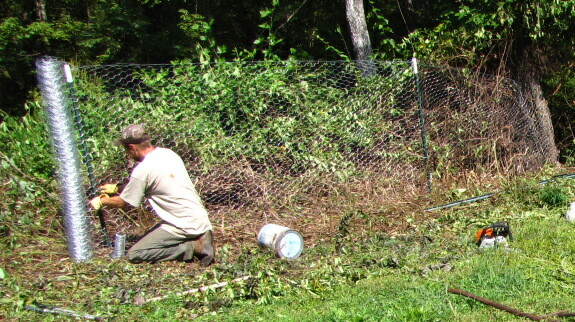 Any ideas for a permaculture deer barrier that will protect the southwest quadrant? Our chicken waterer makes it easy to rotate chickens through several chicken pastures. Just put a five gallon bucket waterer in each pasture and skip watering for months. The deer came back the night I installed the StinkMaster smelly sprinkler system, but they entered at a different spot, which might indicate a behavior of avoidance to the smell zone. One obvious problem is the soapy water clogging up the sprinkler head. I tried switching to a hand held shower unit and it still clogged, but at a slower rate. We got a call from the game warden yesterday and he gave us a 10 day kill permit. I'll save those details for tomorrow's post. If forest garden enthusiasts are entirely honest, I think what we find most intriguing is the idea of a semi-self-maintaining system that gives you food with very little work once it's established. In case I'm not the only lazy forest gardener out there, I thought I'd let you know which plants really thrived on total neglect (or outright abuse) in my extremely poor soil. Comfrey. 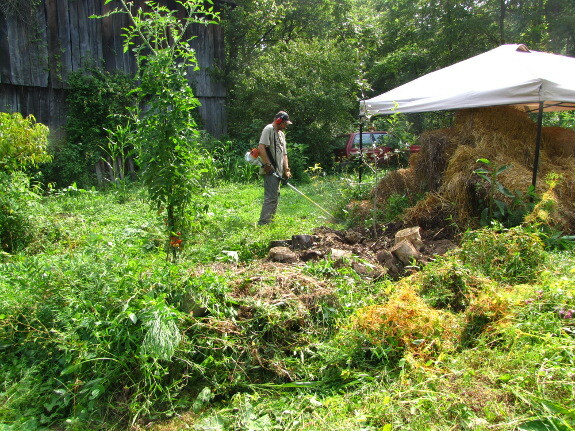 I planted comfrey directly into the ground, cut the leaves multiple times, let Mark mow the plants to the ground, and then forgot about them for six months until the surrounding weeds were eight feet tall. 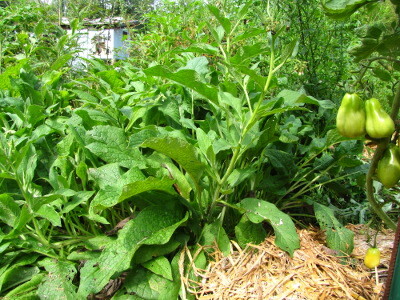 When I came back in to hand-weed the spot, I found the comfrey happily growing and blooming, weed-free. The downside of comfrey, of course, is that you'll never kill it so that location will be home to comfrey forever. But if you've got space far enough from fruit trees that it won't compete with the tree too much for nitrogen, comfrey is definitely a neglected-forest-garden winner. Fennel. I transplanted a few fennel starts into another spot, again directly into the awful soil. The fennel was run over by the truck, mowed to the ground multiple times, and then ignored, but the plant kept popping back up and even looked so obviously cultivated that Mark started mowing around it. With its deep taproot, fennel is probably tough to eradicate, but it doesn't run like mint and does attract a lot of beneficial insects to its flowers. Mint. I know I'm starting to sound like a broken record, but I transplanted some mint into the poor soil and let Mark mow it down multiple times and drive over it with the truck. The mint grew so happily that it took over the nearby hugelkultur mound that I'd made for my apple. That's the major downside of mint --- it's easier to eradicate than comfrey, but spreads much more thoroughly if you don't install a root barrier. I couldn't tell how much or if the mint was competing with the tree for nutrients, but I ripped it out of the immediate vicinity just in case. I think that these three perennials are good candidates for renovating poor soil a good distance from fruit trees. They all produce copious organic matter while comfrey is also a dynamic accumulator of silica, nitrogen, magnesium, calcium, potassium, and iron and fennel is a dynamic accumulator of sodium, sulfur and potassium. I suspect that the trick to using them wisely is to map out the eventual spread of your fruit tree canopies, then plant comfrey, mint, and fennel in the spaces where the tree leaves will never reach (adding a root barrier if you're including mint in the mix.) Trees will spread their roots beyond the canopy, but by the time your trees are mature enough to reach this intercanopy area, they roots will be better able to compete and the understory weeds will have produced enough good soil that there won't be such a fight over nutrients. 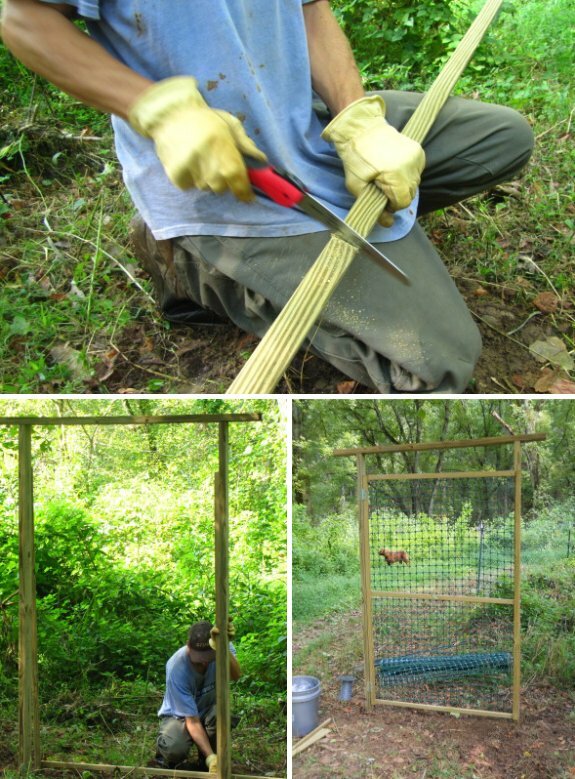 I wish I'd though of this before scattering the three willy nilly throughout the forest garden! Our chicken waterer takes all of the trial and error out of clean water. 1. Call the D.G.I.F. office in the state capital. Did that on Monday. 2. Explain situation to dispatcher who passes message along to the actual warden. 3. Wait.....and wait some more....and then call again on Wednesday. Our local game warden called us back that same day to set up a time to meet. He was free and in the area so I agreed to meet him out at the mailbox. He was very professional and courteous and sort of interviewed me there in our driveway. I guess I proved to him that I was an exasperated gardener and not some blood thirsty hunter who couldn't wait til deer season started. He decided to give me the permit without walking back to actually inspect the damage and took some time to explain how a kill permit works. 1. No Bucks!...that seemed to be one of the more important distinctions. 2. It's the only time you are legally allowed to use spotlights to hunt deer. 3. We've only got 10 days....and no hunting on Sunday. I asked him why no hunting on Sundays? He just shrugged and said "Something to do with the blue laws." I imagined a scene of church pews being almost empty during hunting season before these laws were enacted, which I guess is what would prompt such a law. The picture to the right here is Anna's very first deer back in 2009. I have a feeling we'll be carrying her second home within the next 9 days. 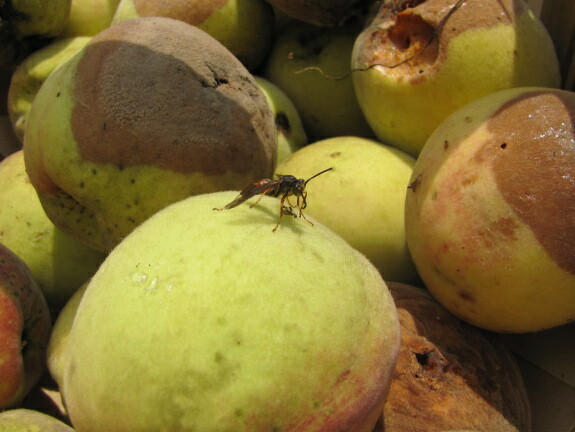 Brown rot is one of the most destructive diseases of peach and nectarine in Virginia.... When environmental conditions favor this disease, crop loss can be devastating. 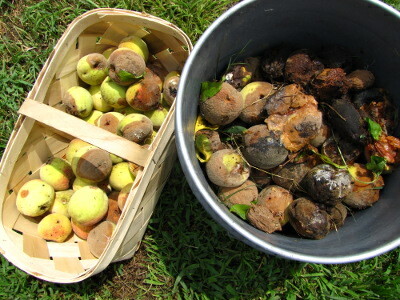 During warm, wet summers, the fungus that causes brown rot infects stone fruits starting at the blossom stage, continuing through cankers on twigs, and culminating in peaches that rot before they fully ripen. We lost every peach (save one) on our younger peach tree due to endless rain, and even though I dutifully picked rotting peaches off the kitchen peach every week, brown rot took nearly the entire crop there too. I ended up with a five gallon bucket of rotten peaches, about two quarts of semi-ripe peaches to turn into fruit leather, and just enough ripe fruits for one dessert. Since I'm not willing to resort to fungicides, it may turn out that we simply can't ripen peaches during wet years, but there are some tricks I can try to at least lessen future catastrophes. Keep the leaves dry. I already prune my peaches to the open center system, which helps the leaves dry off as fast as possible, and I can't do anything about the rain. But I am going to tweak our sprinkler arrangements since they currently hit a little bit of our peach trees when I water the garden. Sanitation. The fungus overwinters in so-called mummies --- dried up fruit that sit on the tree or on the ground. 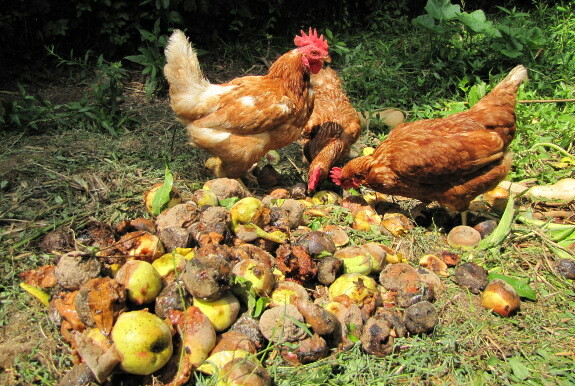 I do my best to remove all bad fruits, but I think I'm going to find a way to turn chickens under our peaches for a little while right after harvest to catch anything I miss. Work harder to prevent insect damage. 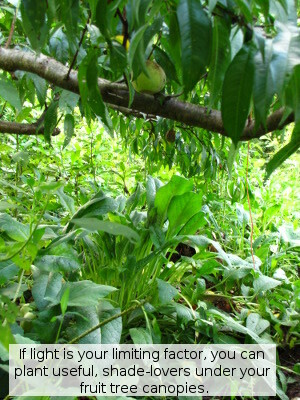 Unripe peaches are usually safe from brown rot, but not if their protective skin has been damaged by insects. Oriental fruit moth larvae were a huge problem in our peaches last year, and even though I clipped off injured twigs and thinned out infested fruits, some still got past my radar. (I'd say my sanitation practices reduced the insect damage by about 75%.) I'm hoping that mini chicken pastures will help with this problem as well since the moths overwinter in debris on the ground and chickens love looking for insects under mulch. Remove the most susceptible trees. Nectarines tend to be more prone to brown rot than peaches are, and in retrospect, that's probably why our nectarine --- covered with flowers this past spring --- set no fruit. The dwarf cherry that set twelve fruits and then had them all rot before ripening also did its part to let the fungus keep reproducing all spring. Neither of these trees is happy here, so I'm going to finally rip them out so that they can't serve as reservoirs of disease that will later infect my good trees. Give my fruit trees less compost. One study suggests that too much nitrogen can make trees more prone to infection by brown rot. Perhaps I need to back off on the compost? Our chicken waterer keeps the flock healthy with clean water. Cleaned out the StinkMaster for another round of experimentation. The next artificial scent I plan to try is the above Classic Spash, which can be found at local Dollar General stores for $1.50. I'll post about the results sometime next week once I've tested the clogibility of the new After Shave, which in my opinion has a much more repulsive odor than the Irish Spring soap. 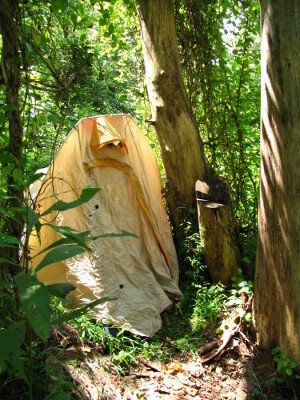 Camp out beside the deer entrance to garden. Theory: If I spend my nights and evenings along this thoroughfare, I'll keep deer at bay and perhaps shoot one for the freezer. Reality: I adore sleeping close to the earth, but miss spending evenings with my husband. Nights with Lucy nearby aren't nearly as much fun, and I wake up every time she moves thinking she's a deer. And --- about the hunting idea --- how am I going to shoot a deer in the dark again? On the plus side, the deer stop using this path and the garden is momentarily safe. Carry the gun while walking Lucy. Theory: Hey, it worked the first time! Reality: The only deer I see are far away in the neighbor's hay field. I'm unwilling to trespass and they're too distant to hit anyway. Hang out on the plateau overlooking the floodplain in the evening. Theory: From this perfect vantage point, I can survey a wide area and will shoot a deer as she unwittingly passes by. Reality: No deer pass by. When I pay more attention, I notice that all tracks in the area are at least a week old. Find out where the deer actually go and stake out the spot with a book. Theory: The deer have to be somewhere (other than the neighbor's field.) 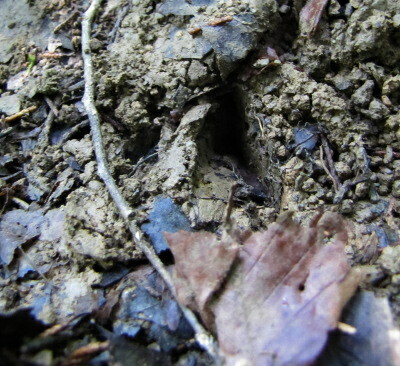 If I can find their most recent tracks and scats and then keep returning to the spot, they'll eventually show up. Reality: Lucy follows me and makes a ruckus for half an hour, but she finally settles down. By the time I'm well engrossed in my book, I barely notice the two does walking down the trail toward me. They snort in alarm and my adrenaline turns me stupid. Rather than waiting in hopes they'll come closer or at least turn broadside so I'll have more of a target, I fire from my lounging bookworm position at one deer's front-on chest...and miss. I really am making progress...or so I tell myself. At least I finally shot at a deer on my third hunting day. Now, if I can just shoot at a deer and hit it. Do you think they'll come back to that same spot twenty four hours later? Our chicken waterer takes the trial and error out of clean water. Roland made a good point yesterday about the StinkMaster After Shave being diluted in water, which got me to thinking of an alternative way of dispersing liquids through the atmosphere. 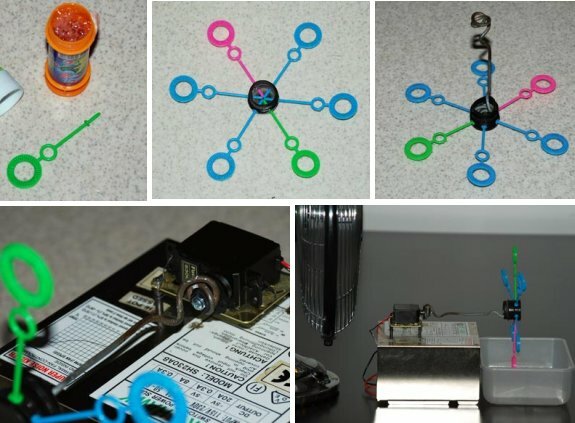 BionicMechanic.com has the details for building an automatic bubble machine for very little money. I'm not sure how much of a scare factor the bubbles might have on the deer, but if such a machine was set up on a timer like the StinkMaster, then maybe an hourly bubble show would be enough to keep a repulsive scent lingering in the area. We had a rash of chicken escapes this past weekend which has prompted us to start building poultry pasture #6. Meanwhile, midsummer is the perfect time of year to smother lower-growing perennials (like grasses and clover) in areas where you want garden beds to grow next year. Cool season grasses have already gone to seed and are currently trying to sock away as much solar energy as possible to store in their roots and allow the plants to pop back up early next spring. By covering up perennials in the middle of the summer, you have the best chance of killing these hardy plants so that the soil will be completely weed-free and ready for vegetables come spring. 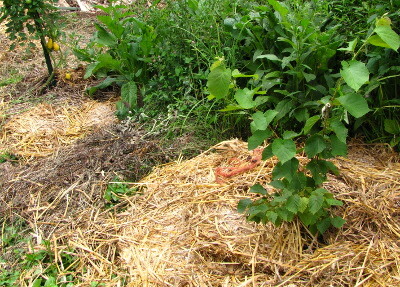 So "weed" in the title of this post does double duty --- I'm using weeds to create a kill mulch to smother other weeds. The main component of my weed kill mulch is those fifteen foot tall ragweed plants from one of our chicken pastures --- I'm pretty sure the ragweed shaded out the understory and made it harder for our Cuckoo Marans to find tender forage. 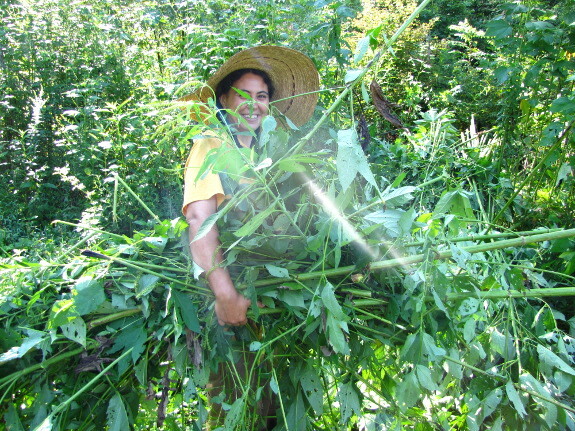 Mark's ninja blade made quick work of the huge ragweed stalks, then I gathered them up and tossed them over the fence to lay alongside the existing beds in the forest garden. 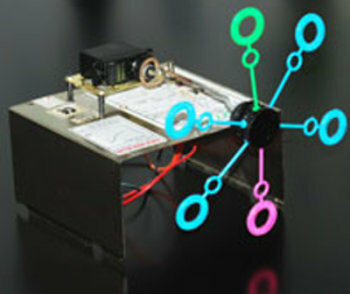 Even though the idea makes a lot of sense, I should warn you up front that this is another crazy experiment. That said, I already tried out a similar weed kill mulch last week when I raked up all of the stalks Mark whacked down in the forest garden itself and use them to increase my mulched area. The weeds quickly died back to a black mass of free mulch, so I'm pretty confident the weed kill mulches will work, although they might need another layer of weeds added on top if perennials start popping up through. 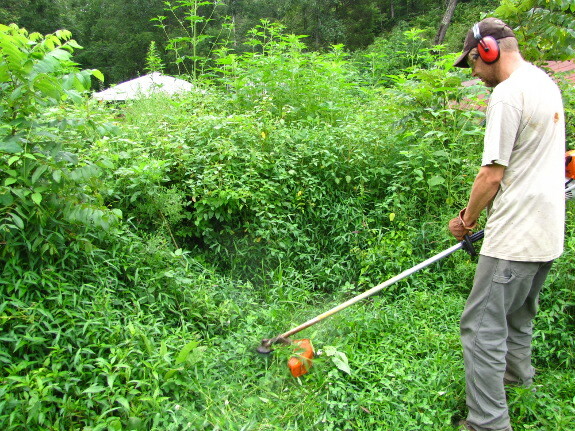 The other factor to consider is the C:N ratio of your weeds. 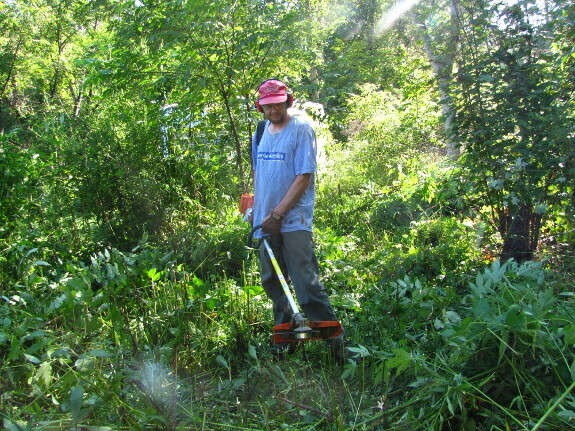 I had Mark cut a lot of saplings in one of the deer danger zones, then I piled them in another part of the forest garden in a sort of horizontal brush pile (three or four feet deep.) 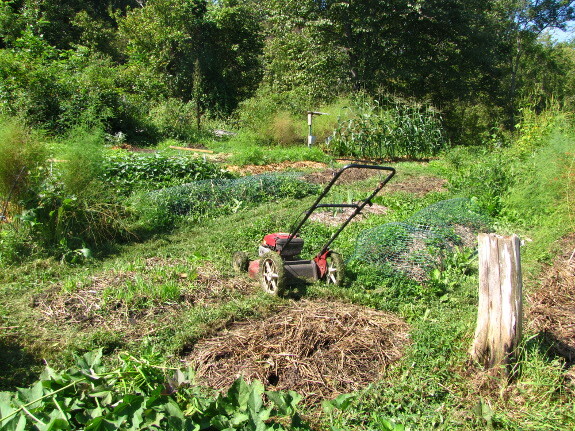 Branches and young trees are too woody to rot down into an acceptable mulch for vegetables by next spring, so I'll either top them off with manure and turn the area into a hugelkultur bed or just throw weeds on top and let the brush pile slowly rot down. Ragweed cut at the blooming stage, though, is only moderately woody, so I have high hopes we'll be able to plant directly under those kill mulches next spring. Anna noticed more deer damage to the sweet potatoes on her morning tour. "Not the ones by the Deer Zapper though....right?" Turns out a leaf grew just tall enought to touch the electrical wire, which burned the leaf and disarmed the Zapper. Maybe I should have installed the wire a bit higher. Perhaps some adjustable legs so that we can raise it up as the plants grow. 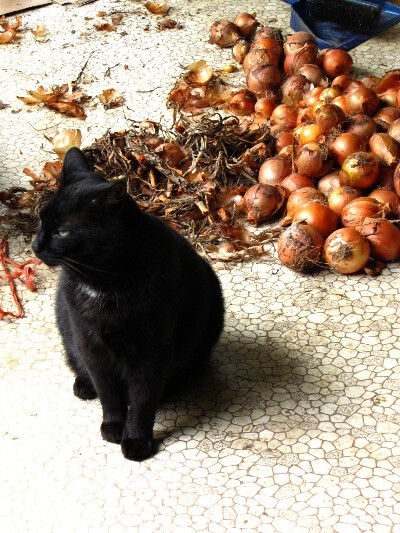 Huckleberry informed me that it was high time I sorted through our onions, cut off the stems, and put them away. I'm sad to say that our beautiful onion braids all started breaking apart after hanging for just a few days. I guess those folks on the internet who recommend you braid a piece of rope in amid the leaves were right. After several braids fell to the ground, I ended up drying the onions on the anti-cat screen atop the chick brooder. Our last set of chicks is due to hatch this week, so I guess Huckleberry was right. 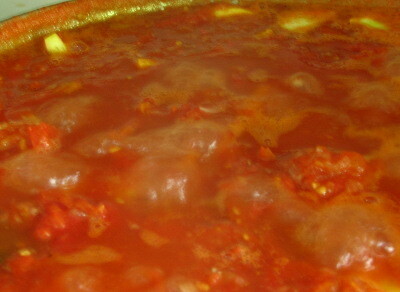 A considerable number of onions were already slightly softened, presumably due to bruising from their unexpected fall. Rather than sorting by size the way I usually do, I instead used a squeeze test to pull out all of the onions that need to be eaten in the next month. 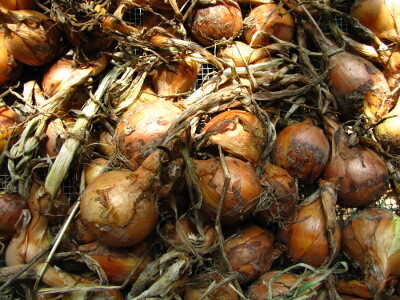 The hard-as-a-storage-pear onions go in other bags to be used later. 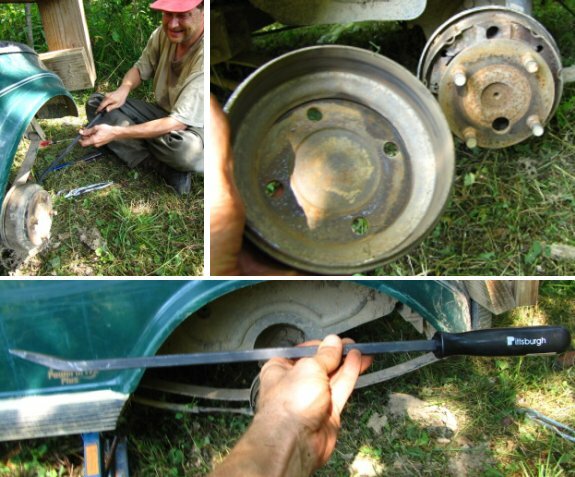 We've been hearing a rubbing sound from the rear area of the golf cart and thought it was time for a brake inspection. I had some difficulty getting the drum off. The main trouble was leaving the parking brake engaged. In my defense it was getting very hot, which seems to increase dumb mistakes for me. Once the pressure was reduced the drum started to back off with some serious effort from a big pry bar. It took about 10 minutes of prying. Pry a little on one side, do the other, and then the top and bottom trying to keep it as even as possible. Mark would appreciate it if you all could talk me out of it, but I'm currently thinking seriously about goats. Our land is perfect for goats (lots of brush) as long as I keep them out of the snail-friendly floodplain, and I think that adding an herbivore to our menagerie would make the farm more productive and fill an empty ecological niche. In the past, I've steered clear because I'm unwilling to follow the lead of my neighbors and chain a goat, and I didn't trust my fencing ability to keep these wily animals out of our beloved garden. 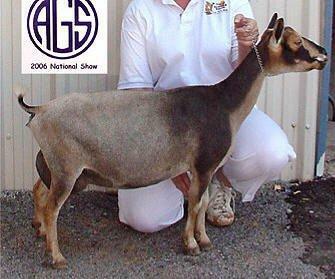 However, Sharon Astyk (fondly known as "blogger Sharon" in our dinner table conversations) assured me that four foot fencing is enough to keep in her favorite variety --- Nigerian dwarf goats. We've been doing a lot of fencing this year for our chickens and already have nearly a tenth of an acre of pasture (with two more pastures partially built.) Since Nigerian dwarf goats are so small, I've read that you can feed them on 0.13 to 0.16 acres apiece, which makes goat pastures sound well within reach. 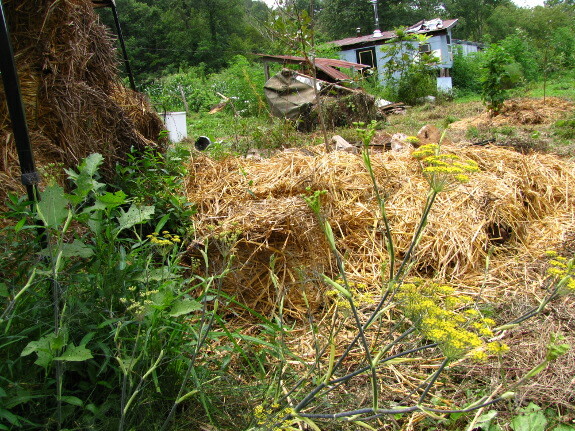 In addition, our chickens won't eat the woodier plants like ragweed and young trees, so it's likely that we could add goats to the chicken pastures without taking away much food from the chickens at all. 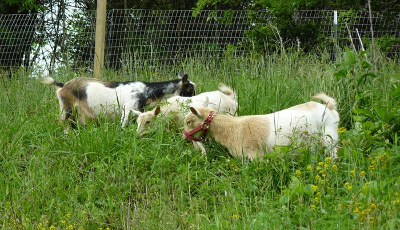 Most people plan to milk year-round, but Sharon reports that if you breed your goats to kid in the spring when forage is at its most abundant, you can let the goat dry off for the winter and hardly have to feed any grain. That means better quality milk and a more sustainable livestock system. In addition, seasonal milking lets you go out of town during the off season without finding a milking helper. Sharon solves the twice a day milking problem as well. She recommends milking your goats in the morning, then putting the kid back with its mother to spend the day grazing together. That way, you only have to milk once a day rather than twice and your evenings are free. Meanwhile, Sharon uses a modified breast pump to do the majority of the milking, which saves her hands --- my carpal tunnel made the idea of daily milking unlikely until I learned about this gadget --- and also lets an untrained friend milk the goat if necessary. Using the seasonal, once-a-day milking method, we'd end up with around 25 gallons of milk from one Nigerian dwarf goat per year, which would fulfill our dairy needs quite nicely. Sharon reports that milk from Nigerian dwarf goats tastes just like cow milk and I've read that goat milk in general is supposed to be easier to digest than cow milk. I used to love milk until I stopped being able to drink the grocery store stuff a few years ago, so I'm hopeful that goat milk could put me back in business. Of course, you also get to eat goat meat in the fall when those kids grow up. I'm tempted to buy one (or two if I think one would be lonely) male dwarf goats this winter to see how he does on our pasture and with our fencing before committing to the whole milking endeavor. Males are much cheaper than good milking does, so it wouldn't be so bad if the experiment didn't work out and we had to eat the goat or sell him. All of that said, there are some very valid reasons not to get goats. First of all, domesticated animals are a huge commitment, and I'm not sure if we're ready to expand the menagerie. And I'm not clear on how the herd dynamics would work out --- could we keep one doe and her kid, bringing her to a local breeder when she's in heat, or would she be lonely in the winter? Any more than one goat would mean doubling our pasture area, which is feasible but more of a two year project. Speaking of which, are our quick and dirty fences really good enough to keep in even the tiniest goats? And do goats in the off season fit our mandatory "can fend for itself for four days while we're out of town" requirement? 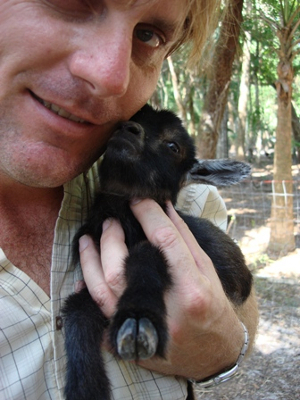 Finally, Mark's worried that Nigerian dwarf goats are too cute to kill, which would make them less enticing. Please chime in with other reasons not to try out goats. I need someone to quench the flame of my desire! Our chicken waterer makes chicken chores almost too easy...thus the dreams of goats. Today was just dry enough to allow a few trips in the truck back to the trailer. 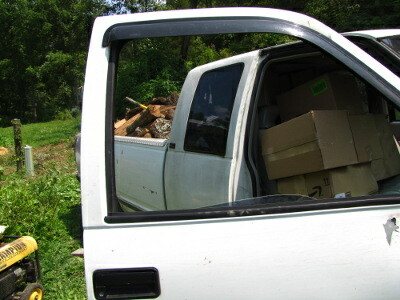 We managed to unload a truck full of lumber, made a much needed trash haul to the dump, and filled up on manure. I must say today was a good day. Whenever I read permaculture-related books, I see great ideas that I can't resist putting into practice. Some of them have amazing results, but half or more fail miserably. Are the authors of the books merely book learners who haven't tried out their ideas on the ground? Sometimes. But more often, they simply fail to mention their specific growing conditions and I forget to think about how the ideas might mesh with my own site. Limiting factor is a useful ecological concept to understand when deciding whether new ideas are worth trying in your garden. Unless you're growing your plants hydroponically under lights in climate-controlled conditions, there's going to be some factor that keeps the crops from achieving their full potential. The scientist who came up with the concept of limiting factors used the illustration of a broken barrel to help others visualize what he was talking about. 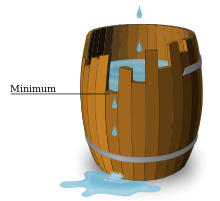 No matter how much water you pour into the barrel, it will only fill to the level of the lowest stave --- the barrel's limiting factor. 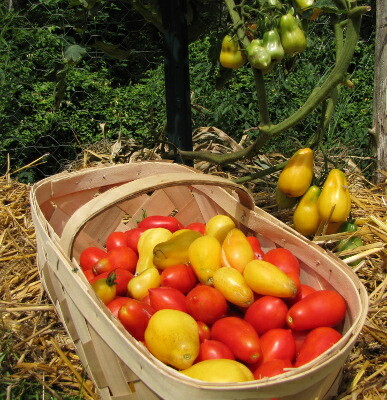 The most common limiting factor for companion planted crops (and the one that's assumed by default in forest gardening literature) is light --- if you plant peppers under your apple trees, the peppers will be puny because the tree leaves steal their sunlight. 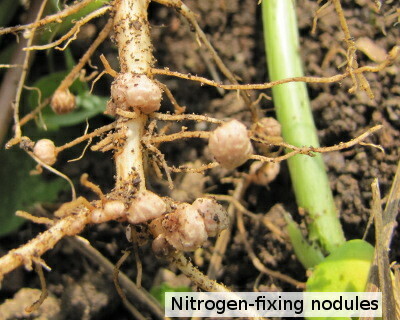 In the conventional vegetable garden, nitrogen is often assumed to be the limiting factor since that macronutrient can quickly wash out of the soil and since plants won't grow much at all if faced with a nitrogen deficiency. 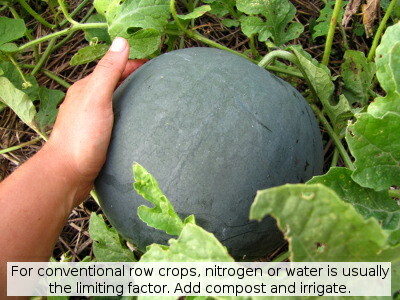 Other common limiting factors include all of the macro- and micronutrients, water, growing season length, cold, and heat. 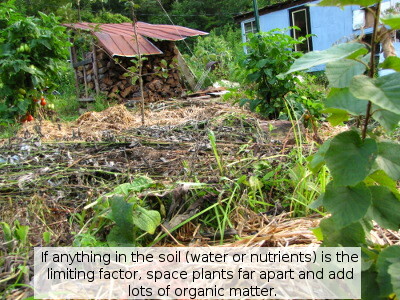 In the eroded soil of our forest garden, the limiting factor is unusual --- depth of topsoil/dry soil. 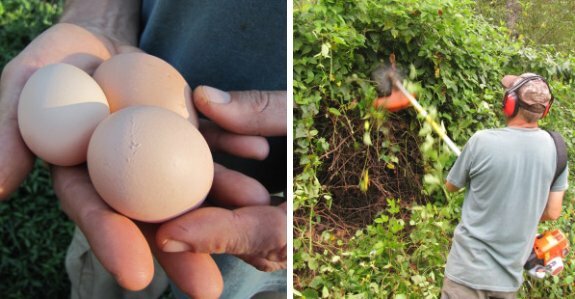 Once I figured out my limiting factor, I had more of a handle on guessing which permaculture tricks were likely to work for me. 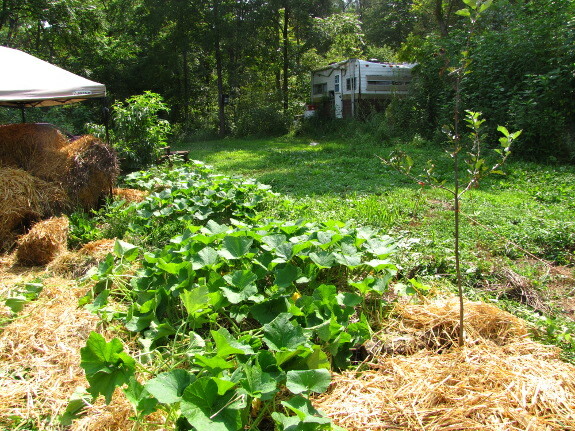 Growing plants in the understory beneath my fruit trees is bad news in the forest garden because these plants will compete with my trees for the most limiting resource --- soil --- and will slow the trees' growth. In my kitchen peach's forest garden island, on the other hand, the soil is prime, so the limiting factor is light. I'm able to grow hungry comfrey directly under the peach's canopy with no ill effects because there are lots of nutrients and soil space to go around and the tree shades the comfrey enough that the understory plant doesn't provide much competition. Instead, comfrey helps out here by pulling micronutrients up from the subsoil to feed to the peach when the comfrey leaves decay. Even the volunteer butternut that showed up in the topdressed compost seems to be thriving beneath the kitchen peach. If you're growing on new ground and don't know what your limiting factor is yet, you could do worse than follow Sara's lead. She plants a vegetable garden in a new spot every year, adding soil amendments and learning what makes that plot of ground tick. By the time she's ready to plant perennials that winter, Sara knows the best spots most likely to keep those expensive fruit trees alive, and she's also improved the soil enough to give them a head start. 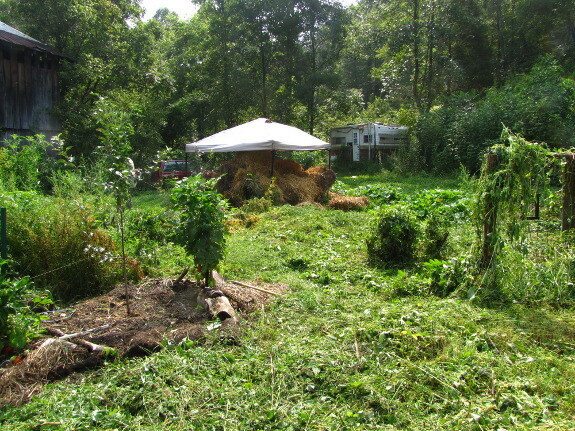 Now that's permaculture in action! 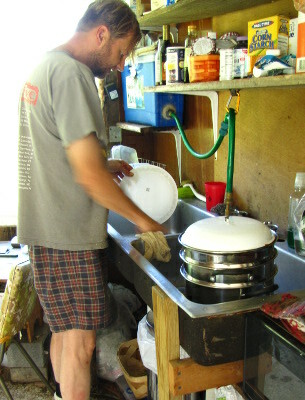 Our chicken waterer solves another common homestead problem --- filthy water in the chicken coop. mark Best British barnyard bird? We've had a batch of eggs in the incubator that started peeping yesterday and of course waited till the wee hours of this morning before feeling ready enough to hatch. Light Sussex is a new breed for us. A classic British barnyard bird that seems to be less groggy on day one than the other chicks we've hatched this year. So, I got busy and forgot to check on our worm bin for...three months. To keep you all up to date, we started a medium-size worm bin in February and filled it with around 9 pounds of worms, shredded paper bedding, and then lots of food scraps from the local middle school. 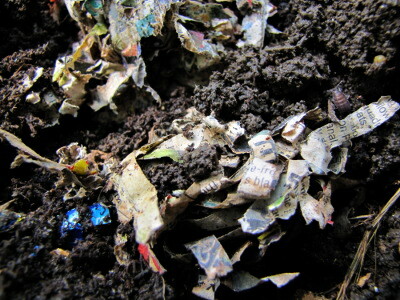 Throughout February, March, and April, we layered food scraps between shredded paper, torn cardboard, and pieces of cardboard egg cartons, until finally calling the experiment a failure. The trouble is that the worms just weren't happy with their environment so they didn't eat. Pests moved in and the whole thing stunk. 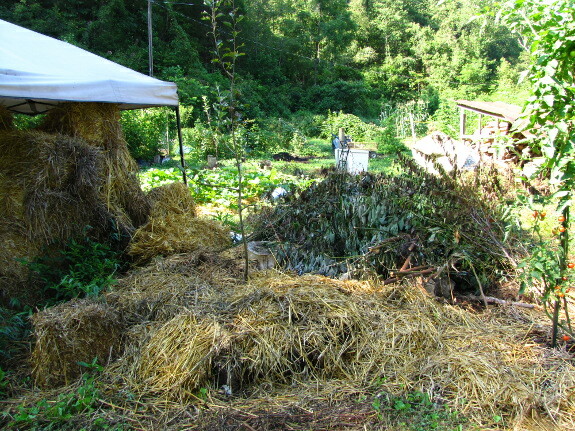 In May, I tossed twenty gallons of horse manure into the bin to see how the worms would like the alternative food. They loved it! If I'd gotten smart, I would have added more manure immediately, but instead I got busy and forgot about the bin. When I finally looked in, I was interested to see that the worms had completely composted all of the manure and had finally started working on the food scraps. The cardboard had completely decomposed, but there were still big chunks of paper present --- clearly, shredded paper is not the best bedding material, even though it looks like it should be. The worms seemed to have run out of food that made them happy too --- I estimate that only about 4.5 pounds of worms remained in the bin. I shoveled all of the worm castings to one side and Mark helped me fill the rest of the bin mostly up with new horse manure. Hopefully the worms will all migrate to the prime food and I'll be able to use the finished worm castings on our fall garden and potted plants. I estimate the total production from 270 pounds of food scraps, 20 gallons of manure, and masses of bedding is about 8 cubic feet (0.3 cubic yards or 60 gallons) --- vastly less than I'd expected, but probably still enough to have positive effects on the garden. Chicken pasture #6 is about half way done, but instead of finishing it this week we decided to start pasture #7. With any luck pasture #7 will block an obvious deer path and maybe steer those midnight snackers toward some other part of the forest. We didn't have a proper post to build a gate frame on, so I used a combination of scrap 4x4's, old bricks, and a 2x4 to make what seems like a solid enough structure. 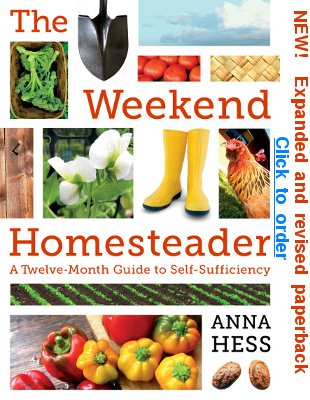 There are a few homesteading projects I consider important enough to make the cut for Weekend Homesteader but which I don't personally undertake very often. The first one was the rain barrel project in the May volume (which seems to have started me thinking about rain barrels --- stay tuned for more on our upcoming rain collection experiment.) 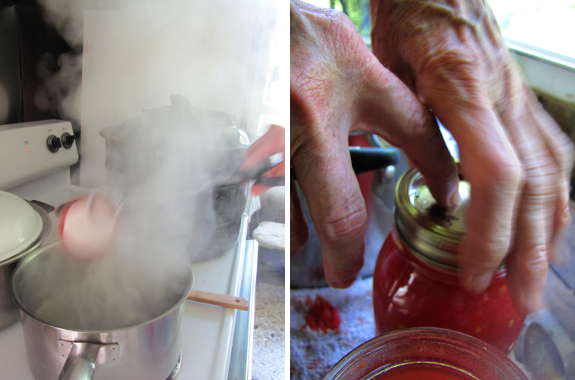 The next was canning. 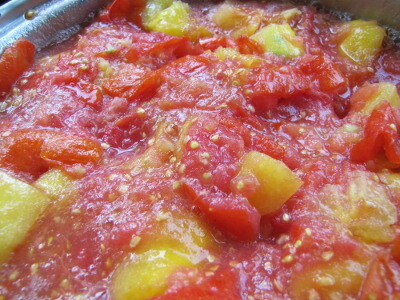 I've canned tomatoes and applesauce a couple of times before, but I'm not a big fan of the preservation technique. You have to save up masses of food and process it all at once, and I just don't think that most foods taste very good canned. 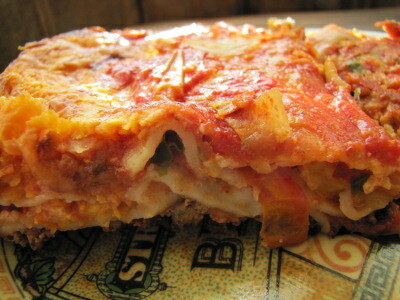 (Tomatoes and apples are the sole exception.) 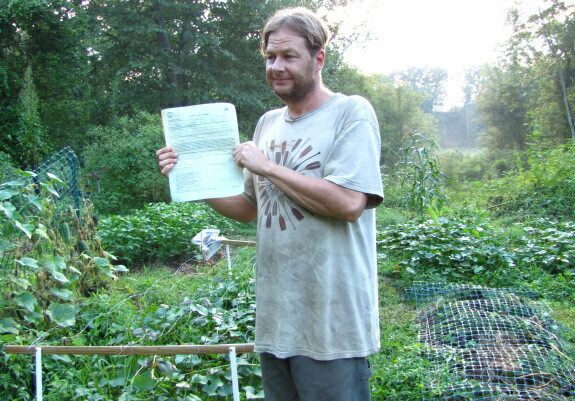 On the other hand, knowing how to can is a good skill for any homesteader to have since you don't need to use electricity and the result will last for multiple years. 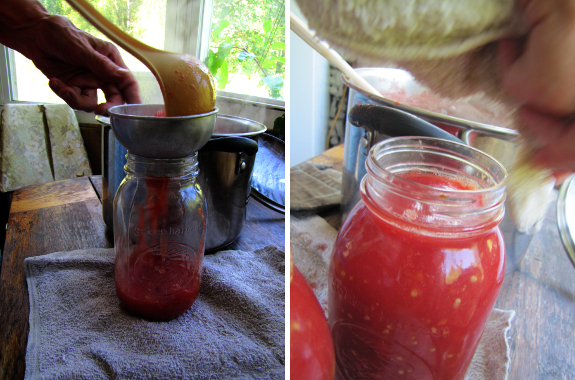 Plus, canning is so archetypal that if I asked ten artists to draw a picture of homesteading, five of them would probably protray canning. I asked Mom to come over and help me preserve a load of tomatoes to refresh my memory before writing up the project for Weekend Homesteader: September. I'm so glad I did! 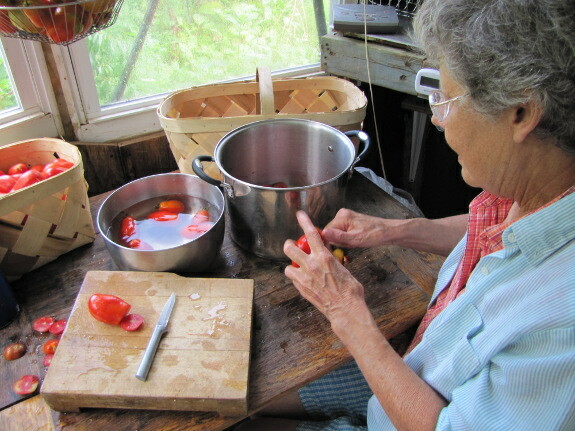 She bubbled over with so much enthusiasm and knowledge that I could tell canning had been one of her favorite parts of living on the land. I know several people who can masses of garden produce every year...then don't eat any of it. 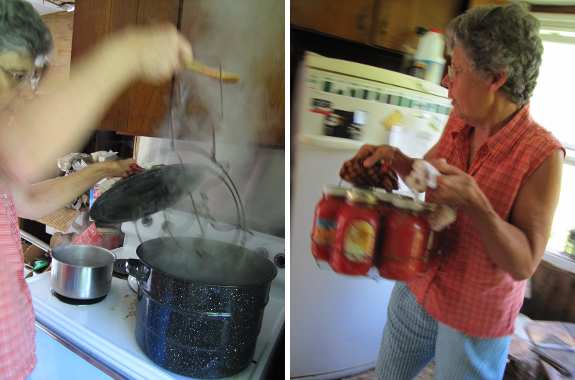 After canning with a passionate expert, I understand how the process could turn into a fun hobby even if you don't like the taste of the results. The boiling water gets your adrenaline pumping, the reflective glass and colorful produce sates your eyes, and canning is a perfect bonding experience if you bring your mom along. Thanks for doing all the heavy lifting, Mom! Our chicken waterer makes chicken chores simple and fun. 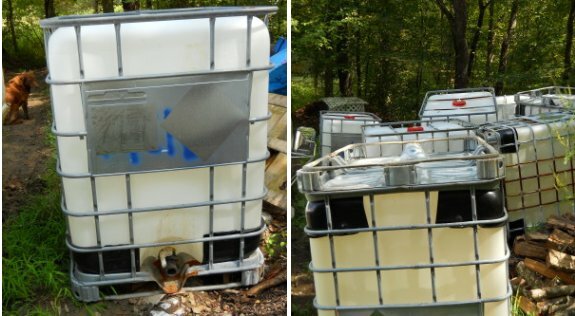 Anna noticed these used tanks for sale in a neighbor's yard last week and asked me to investigate. They all seemed to be in good shape. I worked out what I think was a pretty good deal with the guy to buy all 7 for 25 dollars each. As a bonus he delivered them at no extra charge. An extra bonus was meeting yet another nice neighbor in the community. I'm sure there'll be more than one permaculture experiment we can think of to make use of these intermediate bulk container tanks. I feel like our four incubator runs this year have equated to a semester of Incubation 101, which would make this last hatch the final exam. Good thing I get to write a blog post full of pictures instead of a term paper! We hatched 14 very perky chicks out of 24 eggs this time around. 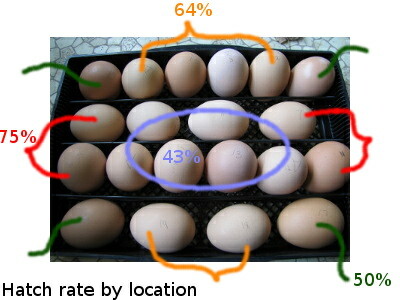 A 58% hatch rate from mail order eggs is above average, so I'll give myself a B+ based on pure math. 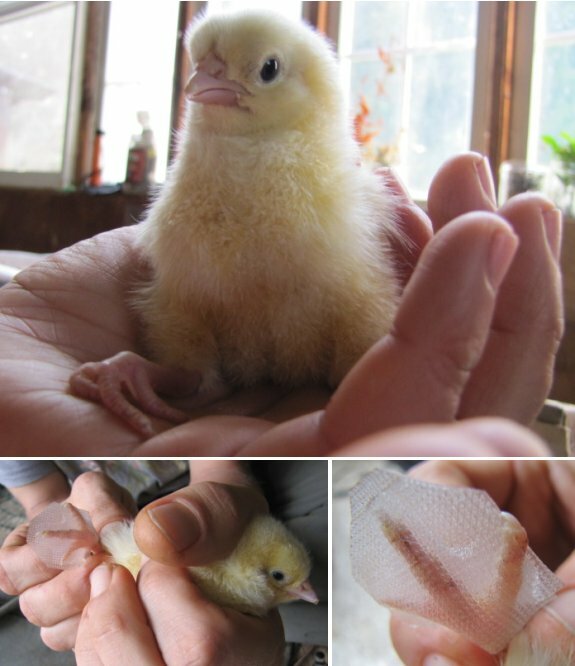 Now that the normal progression of pipping to unzipping to hatching is firmly ingrained in my memory, I barely worried about the incubation process (although I have to admit I woke up to peer into the incubator with the flashlight when the chicks all started popping out of their shells in the middle of the night.) I helped one chick a bit prematurely, then waited a long time to help another chick who might have needed assistance (but who hatched on his own eventually), and yet both of those troublesome chicks are now indistinguisable from their brethren. I guess that's a B on grasping the gestalt of the hatch. Now that I've settled on an incubator that really does the job, I can start learning the ideosyncracies of my equipment. 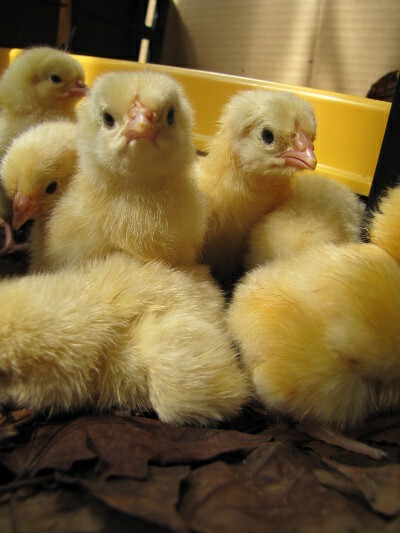 For example, is it coincidental that eggs in the center of the incubator tray are less likely to hatch than those on the edges and tend to hatch later? I only kept data on egg location for two hatches and both showed the same trend, but I just don't have enough data points to know for sure. And if that is indeed the case, what could I do about it to improve my hatch rate --- move eggs around in the incubator every few days, perhaps? And I wonder why the majority of my eggs always seem to hatch on day 22 instead of the stereotypical day 21. Should I be running the incubator a bit hotter than 99.6 even though it's a forced air model? Or am I just counting wrong --- is the day I turn on the heat considered day 0 instead of day 1? I guess I'll learn these more advanced tricks in Incubation 202, offered spring 2012. 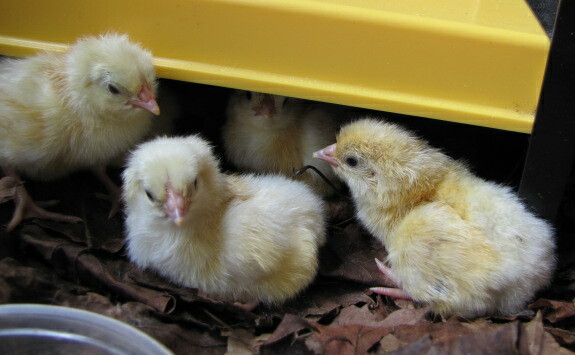 If you want to brush up on your early incubation skills, you might be interested in checking out my other chicken incubation posts on our chicken blog. Our chicken waterer keeps the flock healthy from the day they hatch with POOP-free water. 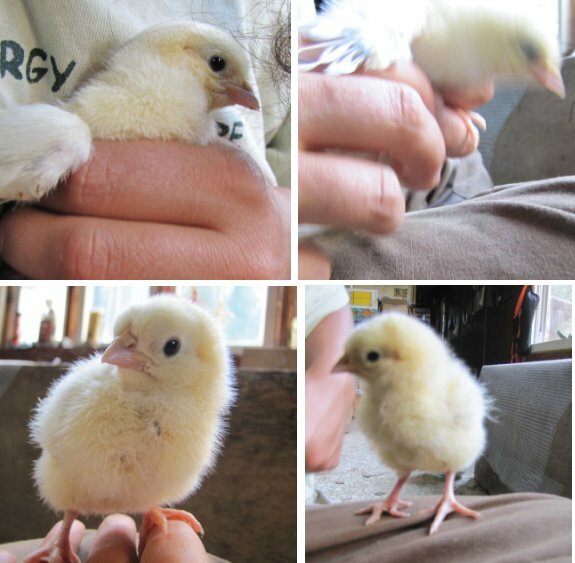 One of our Light Sussex chicks took a little longer fighting his way out of the egg and somehow didn't get to extend his toes on his right foot. 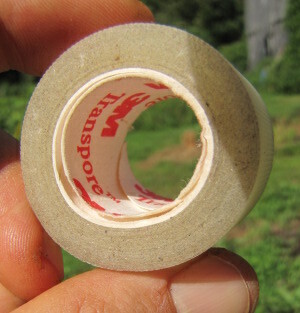 We had some good luck fabricating a splint with a small piece of 3M Transpore tape. I think it's going to work. He pecked at it for a few minutes, and then the other chicks pecked at it for a while and then stopped. 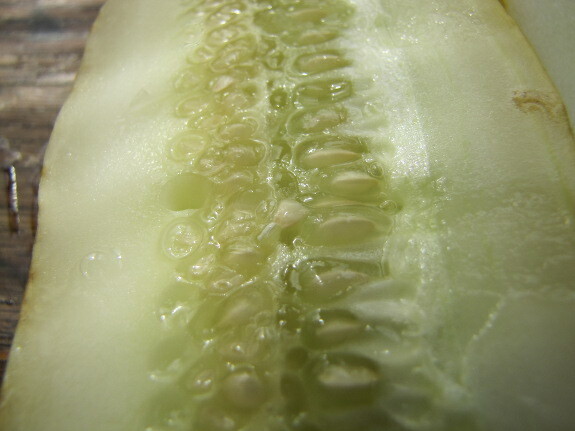 Want to save your cucumber seeds so you don't have to buy them next year? 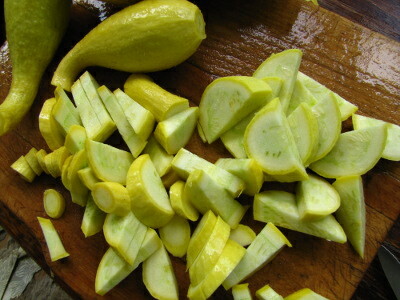 The first step is to let one of your cucumbers grow bigger and bigger until it turns yellow. ...and pull out the guts with your finger. 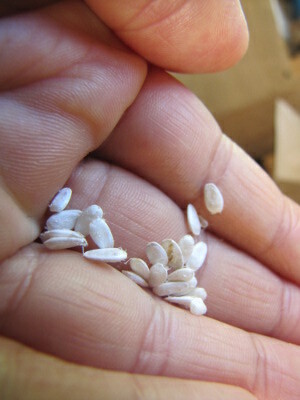 The seeds are enclosed in little sacs of gel, which is a clue that they're not ready to dry as is. 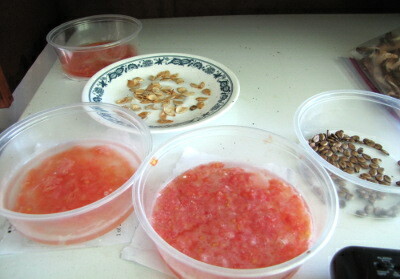 First you need to ferment the gel sacs off the way you do when saving tomato seeds. 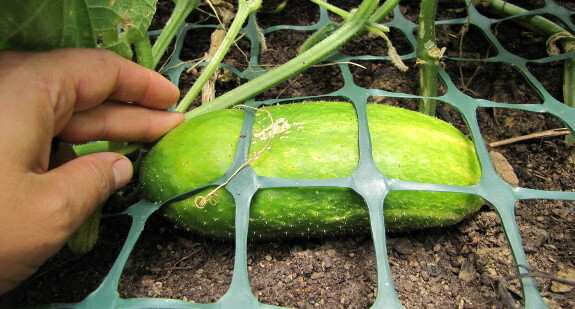 Just pour some water into the container with your cucumber seeds and ignore the cup for a few days until all the seeds fall to the bottom. 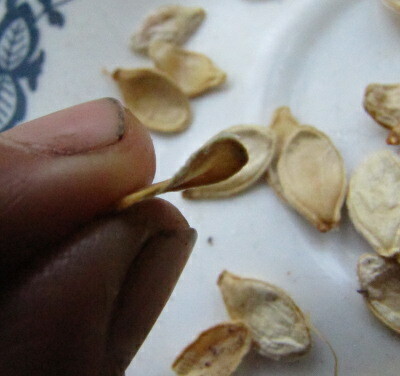 You may need to stir gently with a spoon to make the seeds drop out of suspension. 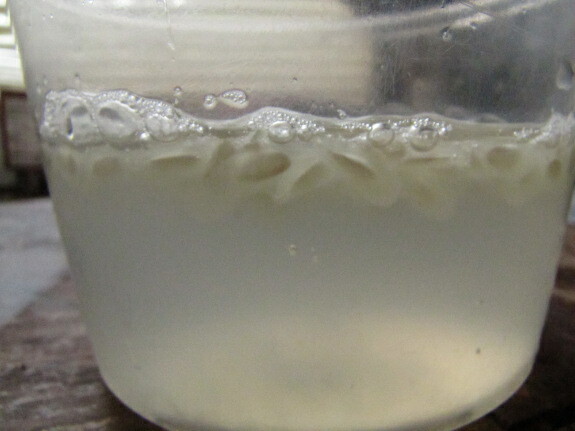 Mold on top of the water is a good sign, signalling that your seeds are ready, but a foul smell means you waited too long. You can still harvest the seeds once the water starts to stink, but your husband will (rightly) complain about the noxious scent in the kitchen. 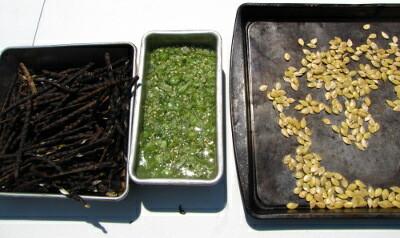 Skim off the mold and carefully pour off the water, then rinse the seeds a few times. Finally, let the seeds dry and examine what you've got. 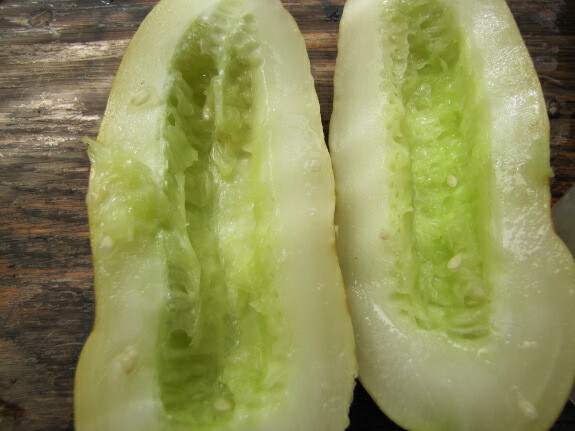 Many cucumber varieties (like the one I tried to save seed from) are parthenocarpic, which means that the female flowers with produce fruit without being fertilized by pollen from a male flower. Parthenocarpic cucumbers are great in the garden since they tend to produce fruits earlier than other varieties, but these cucumbers' seeds will end up looking like the ones shown here --- very flat and small and not viable. I guess I need to find another variety of cucumber if I want to save the seeds! Our chicken waterer makes backyard chickens a breeze and gives you more time for the garden. 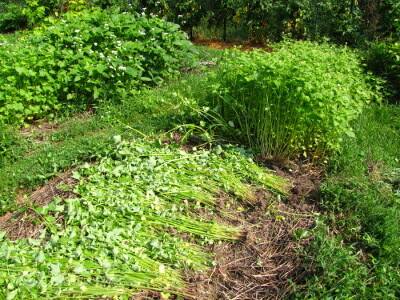 Sometime in early to mid August, the flow of food from garden to table becomes a flood. 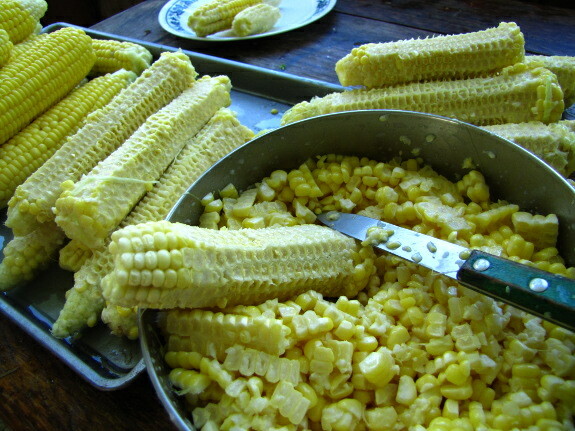 Nowadays, my farm chores are often done in the kitchen, blanching beans, cutting corn off the cob, and stewing up a pot of soup. The garden still needs work, of course, but my priorities have shifted to making sure we have enough bounty preserved to enjoy throughout the winter months. Poor Mark has to deal with the consequences. It's not unusual for a preserving endeavor to conclude with both sink basins and the counter stacked over a foot high with dirty pots and pans, so I sometimes take pity on him and recommend that he use some of our "work hours" to deal with the mess. Cooking and dishes count as a farm chore at this time of year! Our chicken waterer gives the chickens a refreshing drink after they pick apart the mountains of corn cobs and tomato tops. I've been very surprised by how many cover crops I was able to slip into the garden this year without adding any extra growing area or putting in fewer table crops. I never felt like I was leaving beds empty in previous years (except in the winter), but I often had to save a bed for a month or two for succession planting of summer crops or for fall garlic. 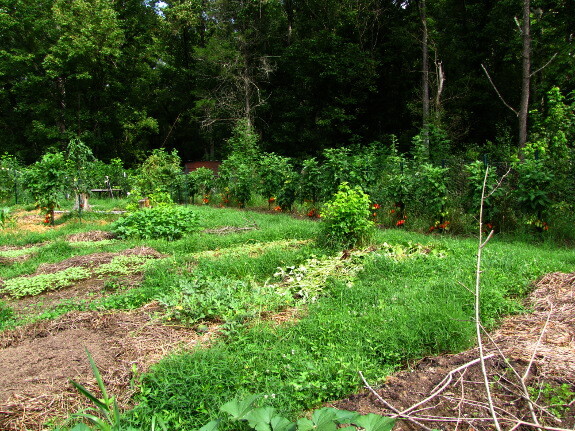 This year, I filled those gaps with buckwheat and/or cowpeas and was surprised to realize my plantings ended up treating a quarter of the garden without specifically setting aside beds to stay fallow. Meanwhile, I'm already seeding oats and oilseed radishes into beds that I know I won't use again until 2012. 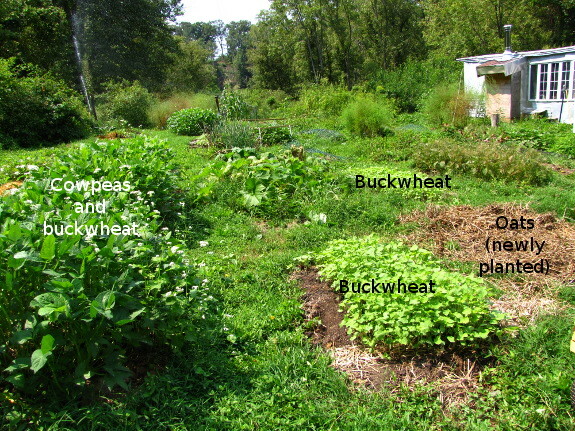 Buckwheat is nice, but the fall cover crops are the real winners, adding much more organic matter, cutting down on weeds (meaning less work in the spring), and keeping the garden vibrant during what used to feel like the downward slide of the garden year. I have to admit, though, that the best part about winter cover crops is that there's a relatively narrow window in which I can plant them --- September 15 is the bitter end for the ones I've found will reliably winterkill --- so I'm forced to keep the garden "clean", pulling up that sweet corn and those buggy beans as soon as they stop producing. An eighth of the garden is now under winter cover, which means I don't have to touch those beds again until spring --- how restful is that? I thought you might enjoy seeing a mathematical snapshot of our garden (minus the woody perennials). Looks like I have four empty beds --- shame on me! Our chicken waterer is the low-work, squeaky clean solution for the backyard flock. The first curled toes splint we did on Monday could have been better. We fixed it first thing Tuesday morning with a fresh splint that didn't let any part of the toe show. We looked at it this morning and decided his toes were flat enough to scamper around without a brace. It seems to be working. It's already difficult to single him out of the crowd now that he's not wearing that 3M Transpore chick toe splint. 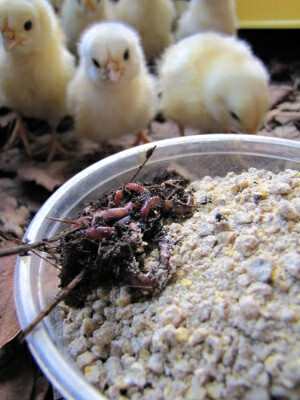 Our Light Sussex chicks eat like crazy, so I decided that six days was plenty old enough to try them out on forage. I don't want to put the chicks on pasture yet for fear of predators snagging such tender morsels, so instead I brought the pasture to them. 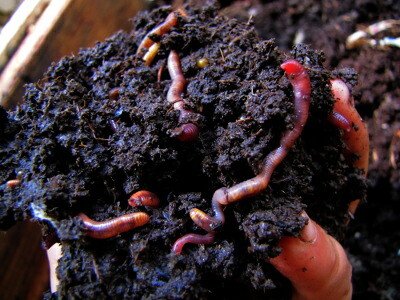 First try was some compost worms dug out of the worm bin. I figured redworms might be small enough for a tiny chick to handle, and I've seen our mother hen feed her chicks worms at this age. But while our chicks were interested and carried the worms all over the brooder, I don't think they managed to consume any. Maybe the mother hen breaks the worms into smaller pieces? Next, I brought in a weed bouquet. 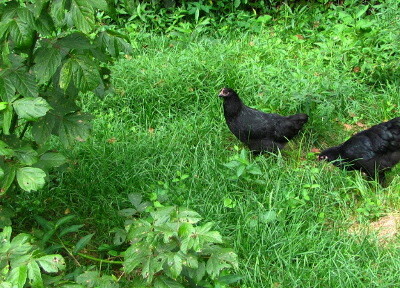 Our adult chickens love broad plantain, clover, and sourgrass, so I included them all (along with some grass and violets that came along for the ride.) 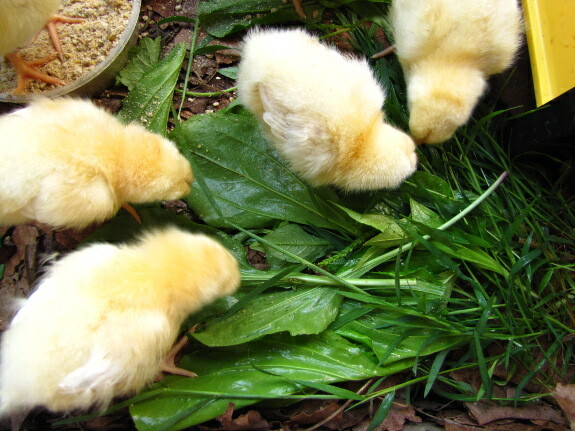 The chicks might have eaten some of the plantain seeds --- it was tough to tell whether they managed to peck any out in the midst of the melee --- but what they were clearly consuming with great pleasure was the sourgrass buds, flowers, and flowering stems. Looks like there's at least something fresh that motherless chicks can eat by their lonesome. Modern chicken-keeping books warn you not to feed your chicks too much greenery at a tender age, but such advice smacks of doctors scaring young mothers away from breast-feeding for fear of malnourishing their babies. In contrast, the hundred-plus year old chicken books I've been perusing this year stress the importance of fresh forage for chickens of all ages. Hopefully a few more weed bouquets will get our chicks in foraging mode before I turn them onto pasture. Our chicken waterer has kept the chicks occupied in the rare moments they weren't eating, sleeping, or perching on top of the brooder. 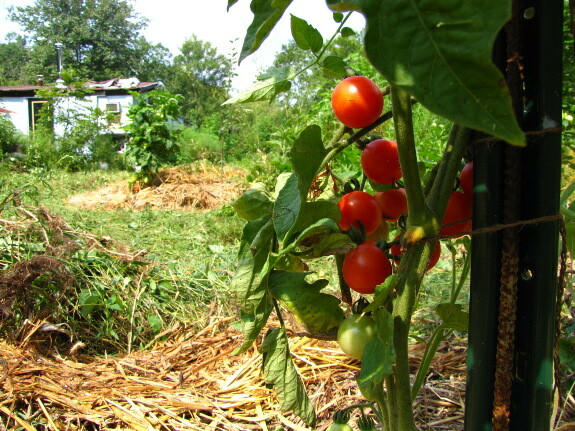 September is peak harvest time on the homestead. 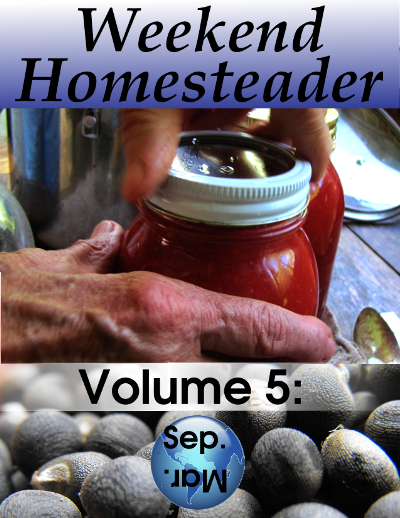 This volume of Weekend Homesteader focuses on the garden bounty as you learn to spice up your cooking, can tomatoes for the winter, and save seeds for next year's garden. Meanwhile, our teamwork exercise is a restful interlude from the hard culinary and horticultural work. I hope you'll consider splurging 99 cents to buy a copy of my newest ebook from Amazon's Kindle store. Your purchases (and extremely helpful reviews!) allowed last month's ebook to pop into the top 1% of all Amazon ebooks, which has helped it see the light of day beyond readers of this blog. 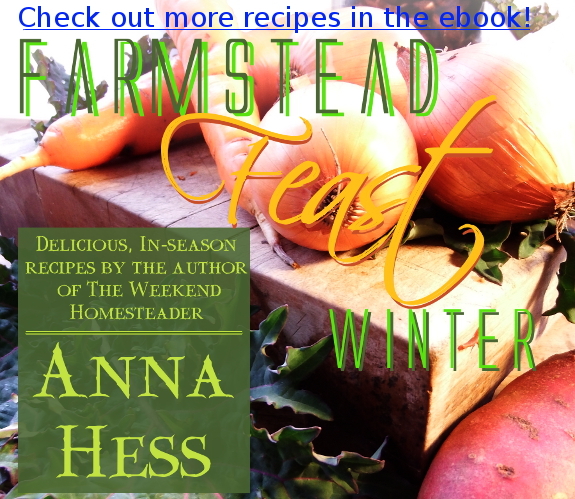 Weekend Homesteader: August has found its way onto 239 kindles already, which encourages me to keep writing. 20 gallons of vegetables + a misc amount of chickens and fruit = 2/3 of the way to our goal of having enough garden goodies to get us through this upcoming winter season. 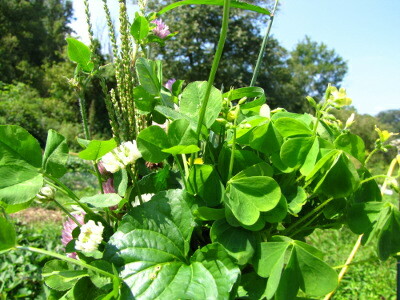 You may remember that I've been experimenting with mixing cowpeas in with my buckwheat cover crop this summer. Although the cowpeas grew well, I'm not sure we'll plant them again next year for a few different reasons. 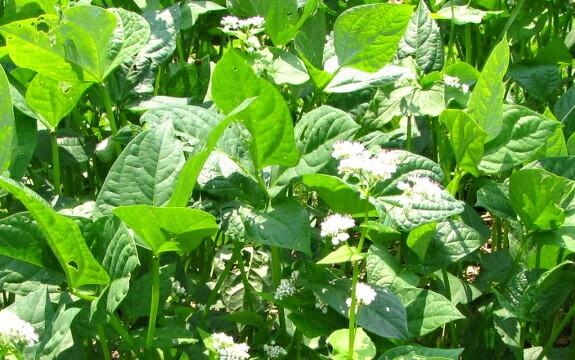 The obvious strike against cowpeas is price. Our local feed store doesn't stock cowpea seeds, and ordering cover crop seeds online is expensive. Buckwheat seeds bought locally clock in at a bit over a dollar a pound, but once you factor in shipping, cowpea seeds cost me about $2.40 per pound even if you buy them in bulk. Now, to be fair, the one pound of seed I bought (for $4.25 plus shipping) seeded 23 beds in combination with buckwheat, which means that if I'd planted only cowpeas in those beds, I would have been spending about 37 cents per bed. That price tag compares very favorably to the roughly $1.33 per bed I would have spent on straw to mulch the beds down for the six weeks between crops. The next problem is ease of killing. Cowpeas aren't nearly as hard to kill as the overwintering grains I fought with this spring, but they do tend to resprout if mow-cut. Even when I pulled up individual plants (a method that turned out to be faster than mow-cutting), perhaps 10% of the cowpeas survived to reroot. On the small scale I've been experimenting with, this regrowth barely had an impact on my gardening time, but I wouldn't want to have a large area planted in cowpeas. Finally, I was disappointed by how long the cowpeas took to decompose. I'd read that cowpeas have a very good C:N ratio of 21, compared to the not-so-shabby C:N of 34 for buckwheat. Those numbers mean that cowpeas should break down even faster than buckwheat and be ready to plant into quickly. 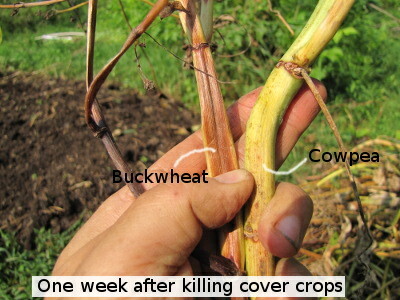 However, when I pulled up beds of cowpeas and buckwheat a week before planting and laid the plants on the soil surface to die, the buckwheat leaves were completely gone and the stems were halfway decomposed by planting time. In contrast, the cowpea leaves were still somewhat visible and the stems were thick and green. 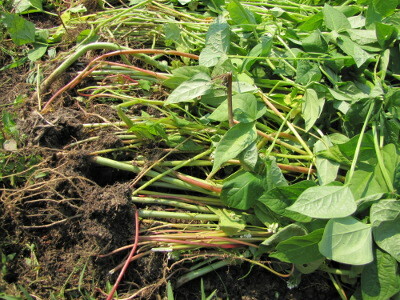 Again, since I was experimenting on a small scale, it was no big deal to layer the cowpea stems as a mulch around the edges of the garden beds, but on a larger scale, I'd probably instead have to kill the cowpeas an extra two or three weeks before planting into them. I guess cowpeas aren't such a quick summer cover crop after all. The good news is that I'm learning to love buckwheat. My gut feeling last year was that buckwheat didn't do much for the garden beds, but now that I've tried the cover crop in non-waterlogged, more loamy portions of the garden, I'm more impressed by this little producer. Filling garden gaps with buckwheat certainly doesn't hurt the organic matter content of the soil, and the bees definitely love them. Next summer, it's going to be buckwheat all the way! Our chicken waterer keeps the flock hydrated during hot summer days. mark Saturday morning deer attack! More deer damage last night....but from a new direction down by the barn. 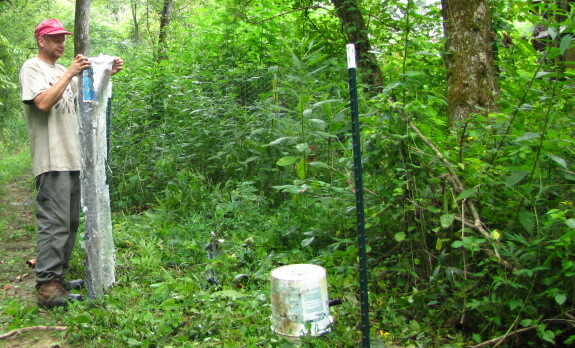 It might mean the recent chicken pasture fence barrier is actually making the deer change their daily route. The latest incursion struck a deep blow to what we thought was a protected area or at least a spot that's made it the whole year without any deer nibbles. 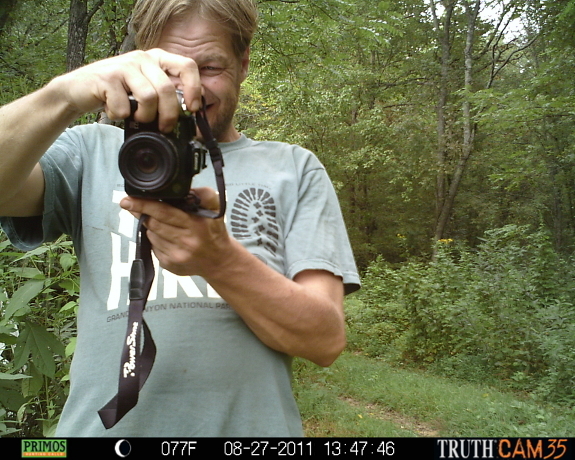 We continue to deploy the mechanical, non-lethal deer deterrent contraptions and added number 5 to the mix this morning, but.....if that doesn't work the above trail camera should give us some data on which way they're coming in from and at what time. The logic is that maybe this particular deer has a window of time when she stops in this area, and I'm not above a good old fashioned ambush if that's what it's going to come down to. Anna Or maybe miniature sheep? Weed control --- We moved all of our chickens from tractors to pastures last fall, which means a lot of pastures to maintain. 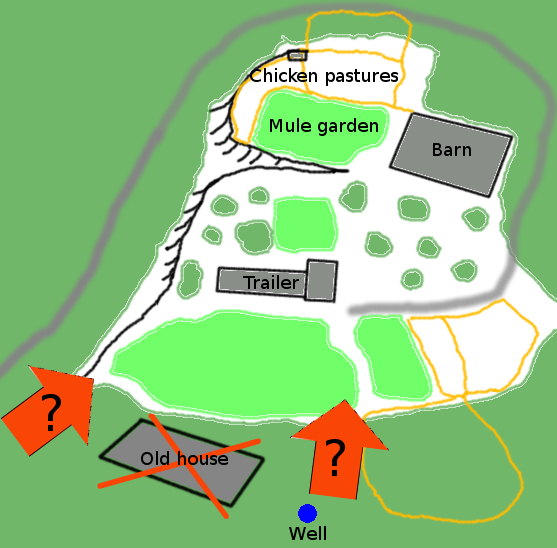 My observations suggest that the optimal pasture for a chicken has a lot of tender herbaceous growth close to the ground mixed in with trees and shrubs. 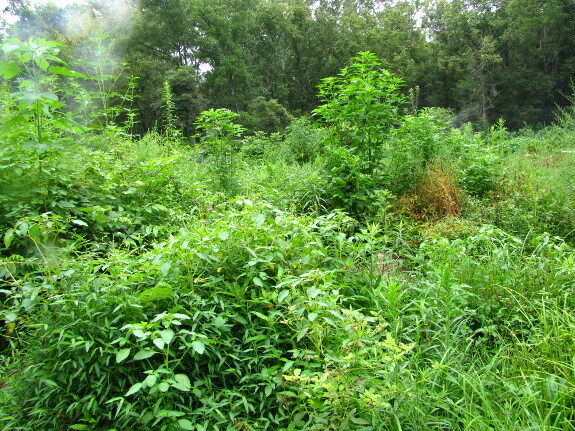 However, what our pastures want to turn into is thickets of tall, herbaceous plants like ragweed, wingstem, virgin's bower, and Japanese honeysuckle, all of which keep the tender growth out of reach of chicken beaks. Yes, we can commit a few days a year to weed whacking, but if we could get an animal to manage our pastures while also producing useful products, how could we resist? Meat --- Eating pastured meat seems to be one of the keys to keeping my moods and weight more in balance, but it's so expensive (and hard to find enough from growers you trust.) Any little bit we grow ourselves would help. 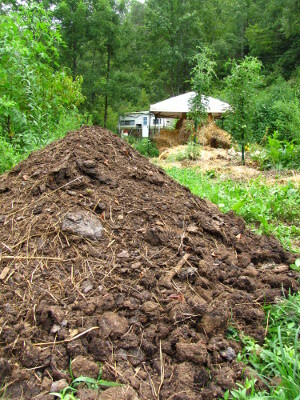 Manure --- Although we'll lose half or more of the manure to the pasture, if we make sure the livestock sleep inside at night on deep bedding, we'll be able to harvest considerable biomass for the garden. Which all sent me thinking back toward the livestock Mark and I had first talked about years ago --- sheep. The trouble with ordinary sheep is that they require a lot of space, having equivalent food needs to about 50 chickens or a fifth of a cow apiece. Then there's the fact that sheep are fans of grass, which makes them much less helpful since they wouldn't eat the big weeds I'm looking to take out. But then I learned about miniature sheep. I've included photos of the varieties I find most intriguing (skipping miniature sheep that are raised primarily for wool.) 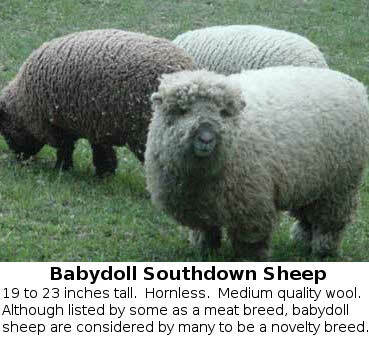 I'm leery of the Babydoll Southdowns, even though they're the easiest to find, because I can't turn up any information on their ability to graze on rough pasture and the name makes me think they've been bred primarily as pets. 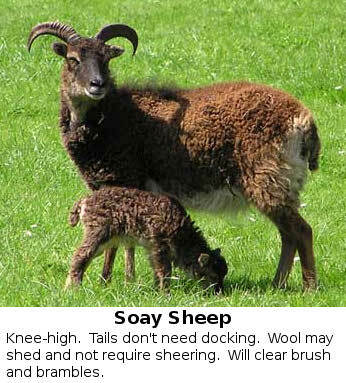 Soay sheep are intriguing but there's very little data about using them as meat goats. 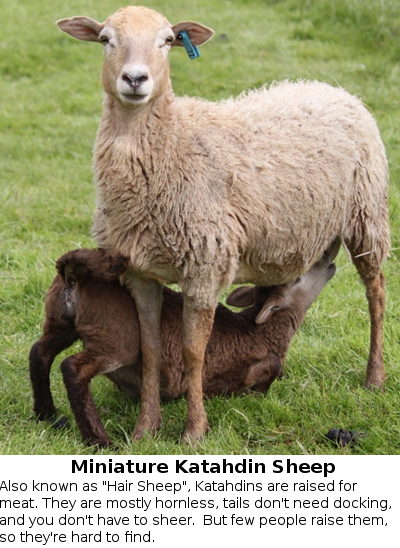 Miniature Katahdins are near the top of my list because all of our neighbors raise the full-size version and "Hair Sheep" seem to do very well in our climate and on rough pastures. On the other hand, a quick search of the internet turns up no local sources of the miniature variety. 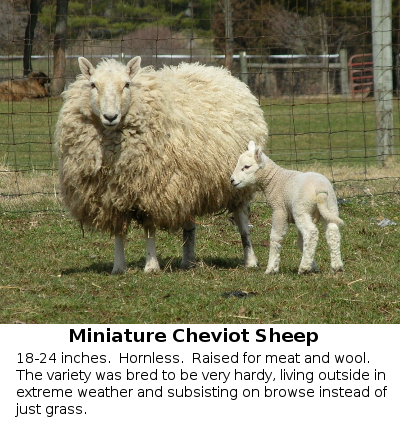 My next favorite is the Miniature Cheviot, which is reputed to have been bred to survive on Scottish moors with no shelter or supplemental food. Although still not very common, there are two breeders within a long day's drive of us, which makes the breed at least feasible. So what do you think about miniature sheep? Have any of you had first hand experience with the breeds I mentioned? Any other forb-foraging, meaty, miniature sheep I should look into instead? Or should we change our sights yet again to a different type of herbivore entirely? 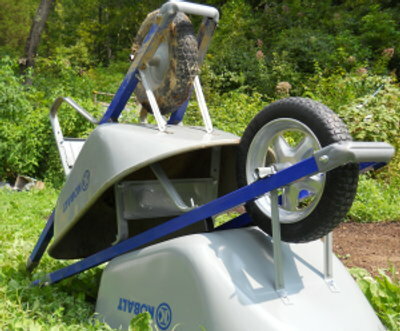 Our chicken waterer means waterers never spill on uneven terrain in pastures. 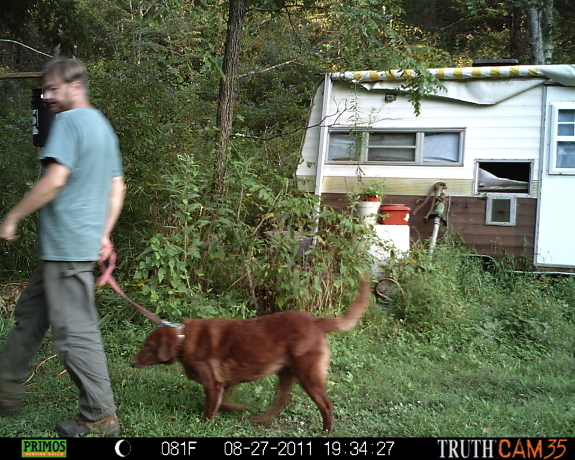 Not much hard evidence from the trail camera last night but now we know it works and have a better idea of the range. Anna moved it this morning to what we think is where the deer came in last night. Anna How many miniature sheep per acre? Years ago, we learned the most important lesson of animal husbandry --- have sufficient pasture before bringing your new livestock home. But how many acres do you need for a sheep or goat or cow? 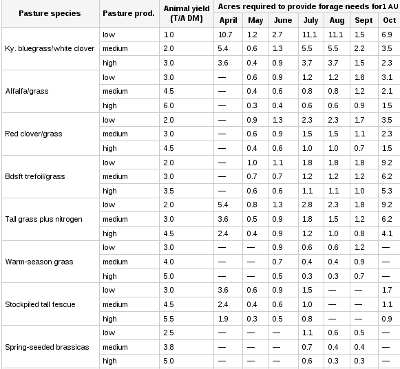 Within a species, you can estimate that the amount of pasture an animal needs is roughly proportional to how much it weighs. So, if you're pasturing bantams, they'll need a good deal less pasture than for standard-sized chickens, and ditto if you're raising miniature sheep or dwarf goats. The figures I found on the internet suggest that an average Miniature Cheviot sheep weighs about 43% as much as a full-size sheep, so each one would be equivalent to 21.5 chickens instead of 50 chickens. We've never raised cows on our land, but I have figured out that our chickens need at least 270 square feet apiece to keep from degrading the pasture. That means we should plan on at least 0.325 acres for a herd of 2.5 miniature sheep (mama, papa, and baby.) If we wanted to keep a similar herd of full-size sheep, we'd need 0.75 acres fenced in. And if we didn't want to give the sheep any supplemental feed in the winter, we'd probably need to double those numbers. 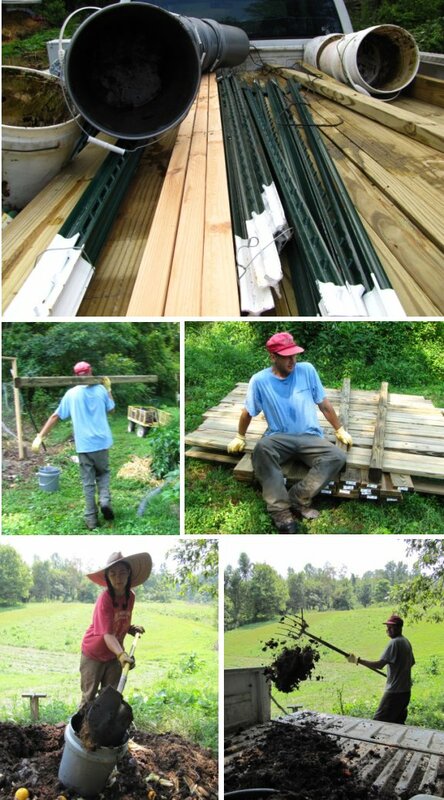 Mark's been building pastures like mad all year, and if we finished up the two he recently started, we'd already have almost a quarter of an acre fenced in. Maybe miniature sheep wouldn't have to be pushed as far into the future as I thought? Our chicken waterer makes care of our flock too easy. Maybe that's what makes me dream about sheep? We got our first egg today from the group we incubated and hatched back in the spring. Feels like one of the signs of Summer starting its long goodbye as it coincided with the first morning it felt cold enough to wear long sleeves around here. Thank you Summer....I know I sometimes complained about all the extra rain you brought this year, but I loved every wet minute of it and would like to take this moment to express my deep felt gratitude for the wonderful bounty we've already harvested. I look forward to seeing you again next year. 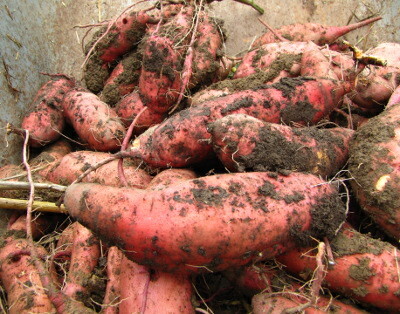 I've written before about when to harvest sweet potatoes --- the short answer is, I usually dig the tasty tubers sometime in late September. So why am I pulling them out of the ground in August? I've decided to cut our losses with the sweet potatoes in the most deer-friendly spots. 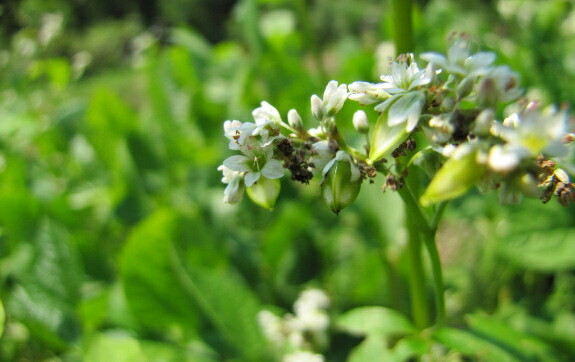 After all, the tubers are used to store energy, and the plants need energy to regrow leaves each time the deer invade. After a certain number of defoliations, we'll actually get less tuber weight by waiting than we could by digging now since the plants would use more energy to regrow their leaves than they got back through photosynthesis during these shortening days. Okay, there's also the fact that I had a nightmare about the deer digging my fall carrots out of the ground with their hooves after being attracted to the sweet potatoes. Who says I garden scientifically? The tubers in the beds planted on May 13 and 20 looked pretty much full-size, so I don't think I lost too much by digging early. The mule garden bed, though, was the last in --- planted on June 3 --- and clearly could have used more time. Hopefully the four remaining beds --- two lightly deer nipped and two protected by their proximity to our front door --- will give us even bigger yields. 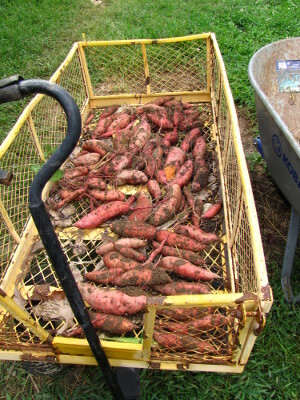 The one advantage of harvesting some of our sweet potatoes early is that it allows me to spread them out in the yellow wagon to cure. I always struggle to find enough dry, shaded spots to set up screens during the curing period, so it's great to be able to use a mobile drying station. Corn is my summer garden calendar. 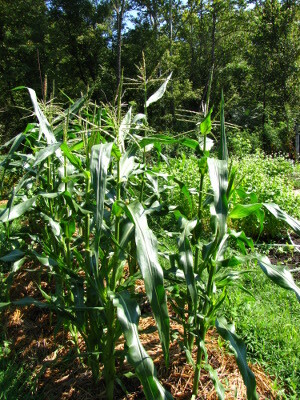 I plant new beds of sweet corn every two weeks in spring and early summer, but the harvests don't come in two week intervals. 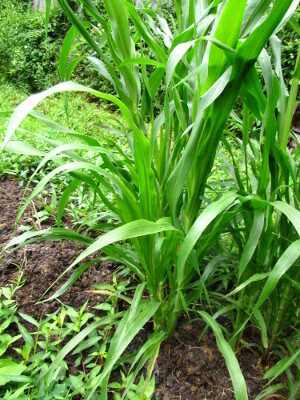 Instead, cold soil slows the growth of early beds, long days and hot weather speed up midsummer corn, and then fall beds are stunted by shortening daylight. With only two plantings of corn left in the garden, I know winter is coming. So does the corn. Our latest planted corn is tassling short, bound and determined to at least set some seeds before the frost. I tried to explain that we still have six more weeks of summer, but the corn wasn't listening. I figured the corn had a point, so I've been washing extra loads of laundry to take advantage of the last of the summer heat. Winter blankets and coats are much easier to dry in August than they would be in November and it'll be nice to go into cold weather with everything clean. Our chicken waterer keeps the flock well hydrated on hot summer days. The second date Anna and I went on was a trip to the local flea market where we bought a cheap mini sledge hammer for 5 dollars about 7 years ago. 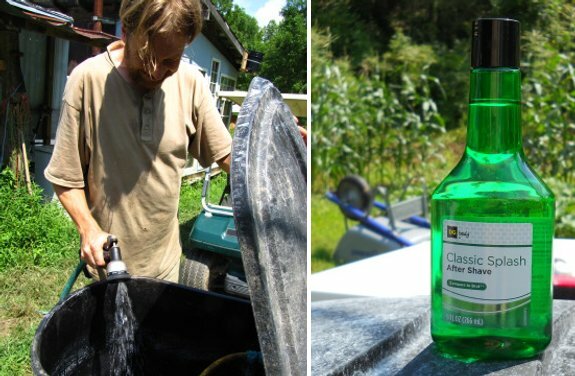 It seemed like a good deal at the time, but we've since learned that cheap tools are often not cut out for serious homesteading work. In all fairness to the makers in China the hammer in question did recieve some improper use from a helper missing the post and hitting it with the handle, which most likely contributed to it breaking the other day. Sometimes a pole driver makes hammering a T-post easier, which we might get in the future, but I've got used to using a mini-sledge. I doubt if the handle will ever break on our new Stanley Bostitch Antivibe Hammer. It feels more balanced compared to holding the other mini sledge and pounds like a dream thanks to the fiberglass core in the handle.